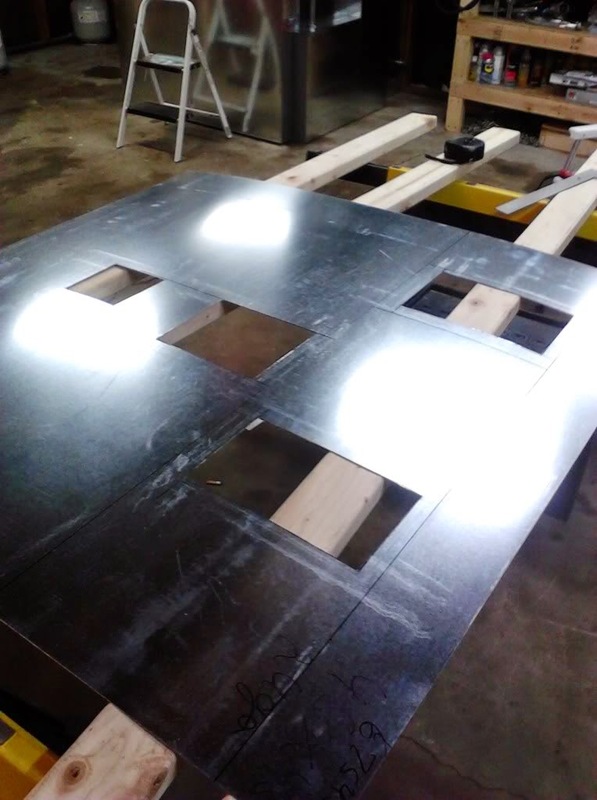 Welcome to "How to Build a Powder Coating Oven - Part II." 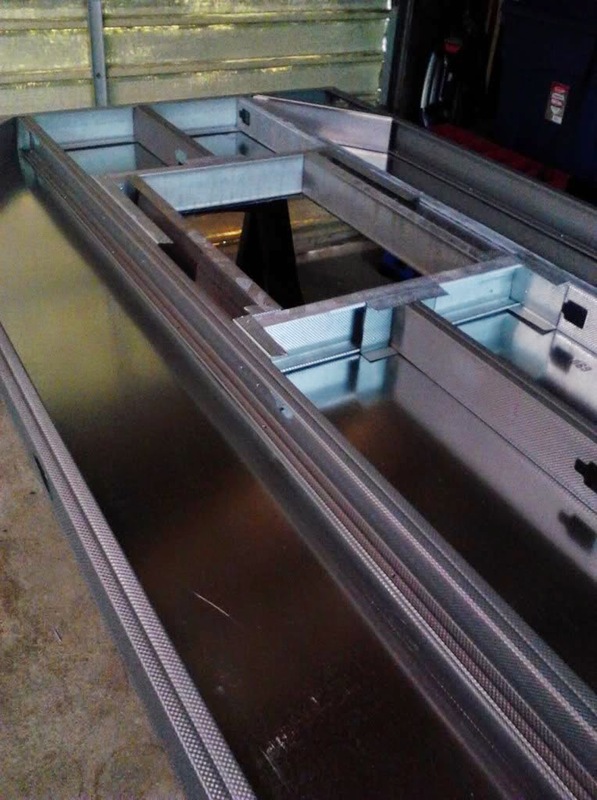 See How to Build a Powder Coating Oven Part 1. 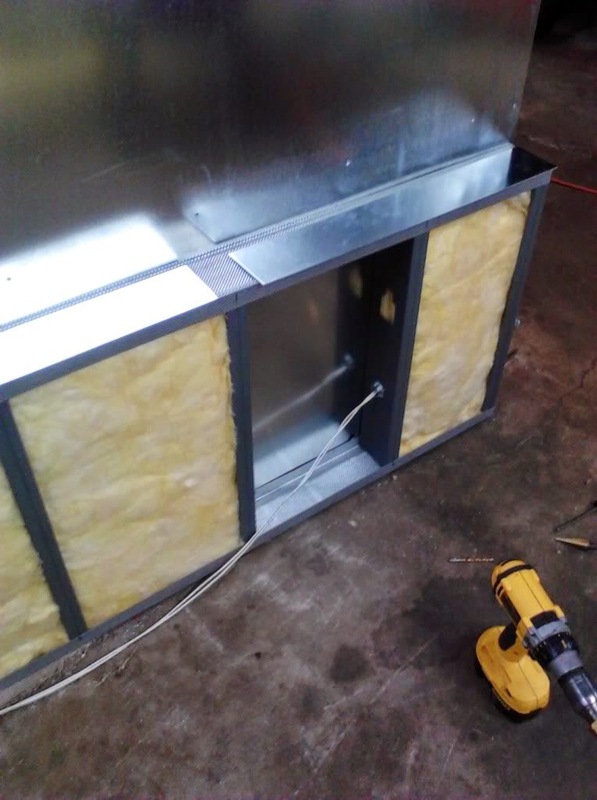 In part 1, we build the oven frame, we started skinning it in sheet metal, we added lights and the convection blower, and also insulation and heating elements. I am going to pick up right were we left off. 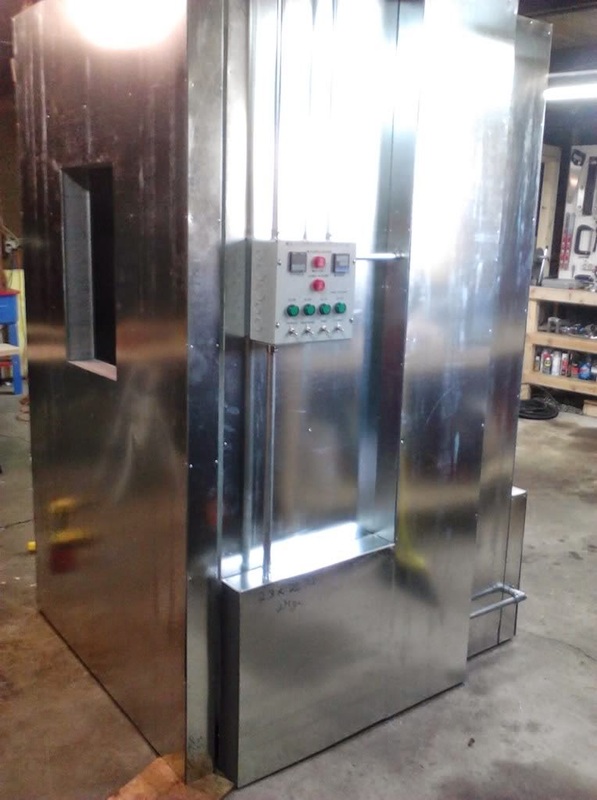 This powder coating oven build was done by KNJ Custom Coating and I want to thank them for contributing all of the information and pictures. 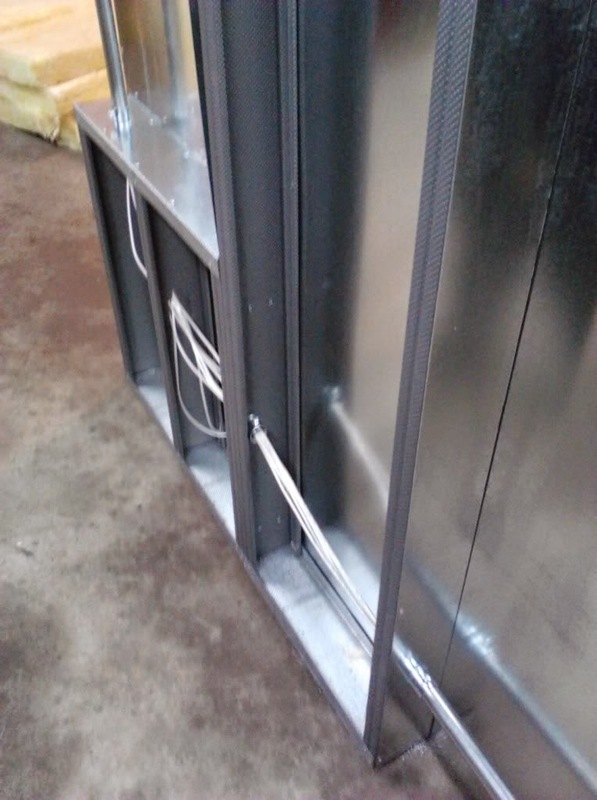 The door for this powder coating oven is constructed the same way as the rest of the oven using steel studs and sheet metal, using rivets to hold everything together. This door also features a window so you can your parts inside of the oven. A cool thing about the window is that it is built into a smaller access door so there is actually a door within a door. The small access door allows you to open it up and check the part temperature using an Infrared Thermometer , if you are not using an Infrared Thermometer to check part temperature, learn why you should be, read this article. The small door is very small and will not let out much heat in the oven. If you opened the big door every time you wanted to check your part temperature, it would cause a drastic temperature drop in the oven because you allowed the heat to escape. This will cause fluctuations in the temperature which is the last thing you want when you are curing powder coated parts. After the basic frame is constructed, the framing for the window is started, the access door was an afterthought and the framing was redone after the following 2 pictures. However these pictures give you an idea of exactly how it was framed. 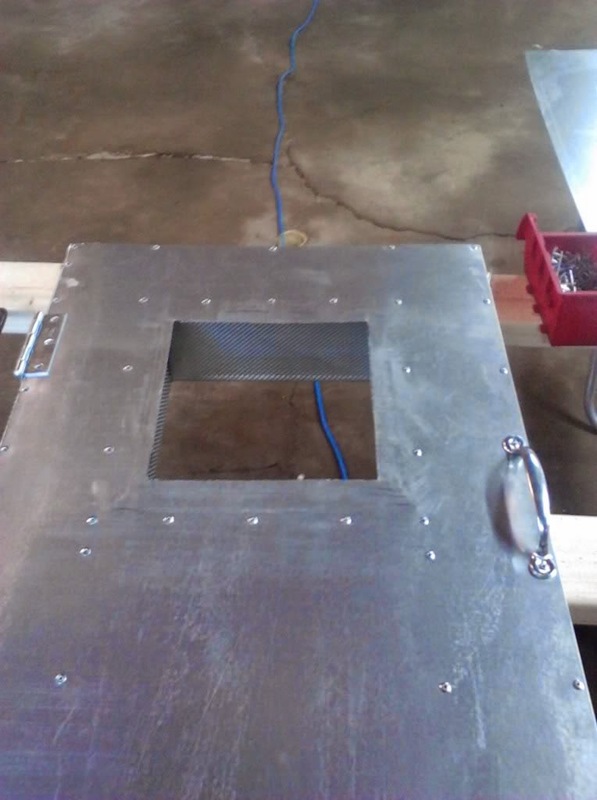 Here is the frame for the access door. As you can see, it is too large to fit into the recently built frame in the above pictures. The upper square boxed section will be used as the window and all of the other open sections will be filled with insulation. One side of the door was skinned in this picture and also corner braces were added to the door for extra support. Since the door will not be a part of the main oven frame and will just hang when the door is opened, it needs all the support it can get to remain square. Here you can see the dimensions of the door. A very important aspect of building this door is the angled cuts used on the sides of the door. If the access door and door frame were perfectly square, the door would not be able to open. These next 2 pictures explain how the angled cuts were used to allow the door to open. Then the hole for the window is cut out leaving a lip of sheet metal that extends past the stud about 1/2" on all 4 sides. Now the window installation is started. Installing the oven window takes more steps than you would think. When heated, glass and metal will expand but they will not expand exactly the same at the same temperatures. If you sealed the window directly to the metal using high-temp sealant, this would not allow for any flex and the window would likely crack due to the different expansion rates of the metal and glass. 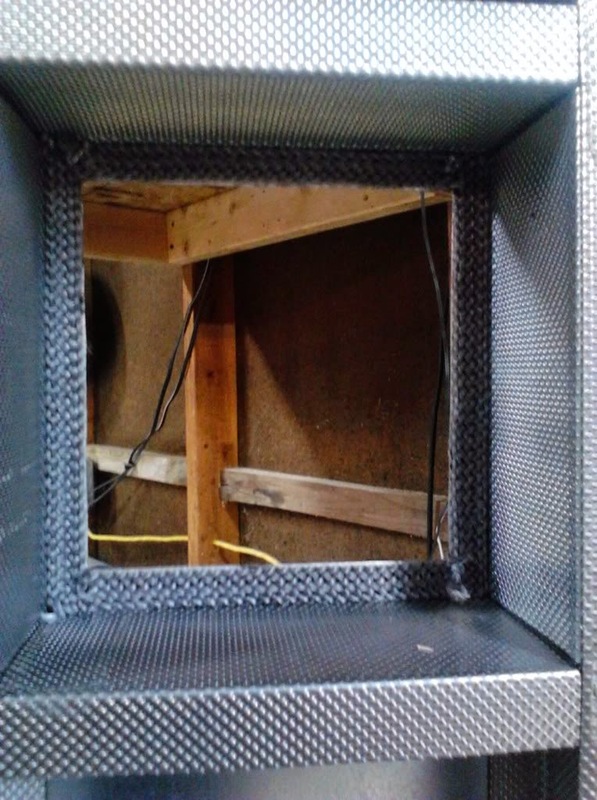 To solve this, first high-temp sealant is added to the inside lip of sheet metal, and then an oven window seal is added to all 4 sides in strips. And the oven window seal is laid down over the sealant. 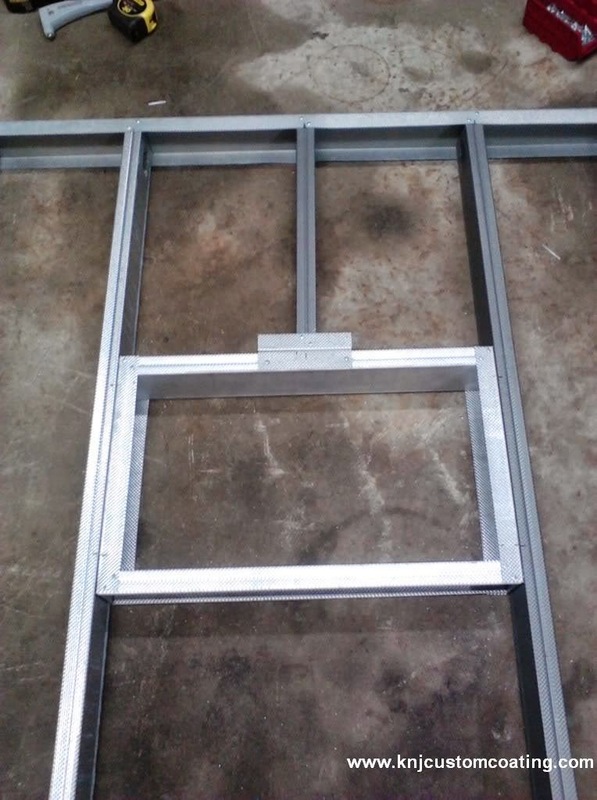 Then the window is laid in place and secured with thin strips of angle iron. Each of the angle iron pieces also has a piece of oven window seal applied using the high-temp sealant. The window is now secured in place and sealed, but it still has a little room for expansion and movement due to the soft seals. The window used appears to be about 8" x 8" and for safety, I recommend tempered glass. Your local hardware store should have pieces of glass that you can buy or you can easily find it online. This process is repeated on the inside of the door. This way, you will have 2 sheets of glass and an air gap to keep the heat from escaping. This window is installed in reverse order of the first window. First the thin angle iron with the oven window seal applied. Then the glass is laid into place. 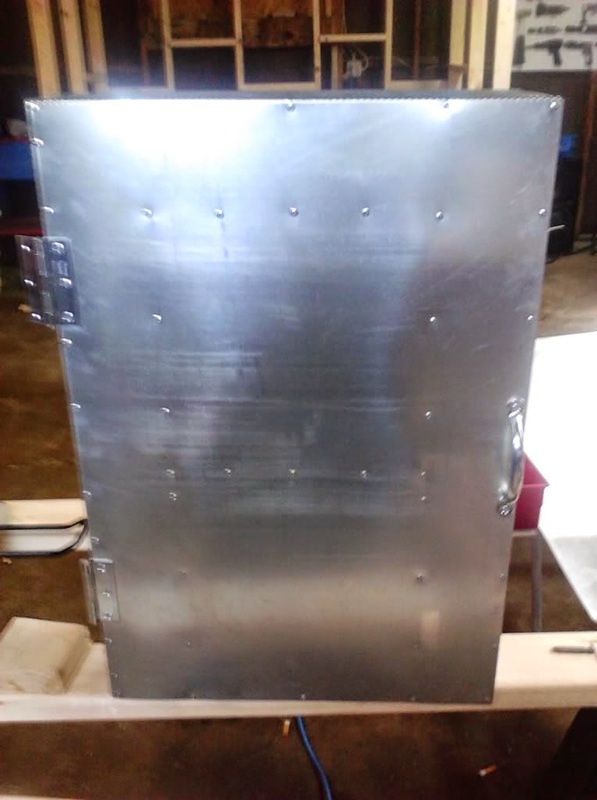 Then you will start work on the inside sheet metal door skin. Cut out the hole for the window leaving a lip that extends past the stud, apply the high-temp sealant and oven window seal on all 4 sides. Fiberglass insulation is then added inside of the door and the inside door skin is riveted into place. Insulation can be cut by a utility knife, just use a straight edge like a 2x4 laid down on the insulation as a guide. When working with fiberglass, make sure to cover all of your skin up, wear a dust mask, gloves, and safety goggles. As for the sheet metal, you can either have it cut by your sheet metal supplier to your specifications or you can make the cuts yourselves. All cuts in this oven build (except for the large sheets) were cut using a Dremel with a reinforced cut-off wheel. The access door is now completed and can be set aside. 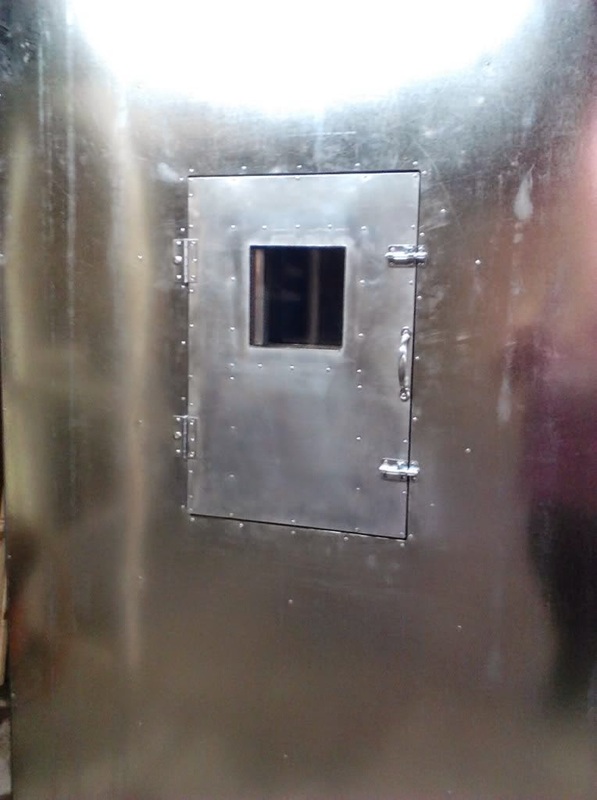 The main door-frame is then insulated and the inside sheet metal skin is installed and riveted into place. 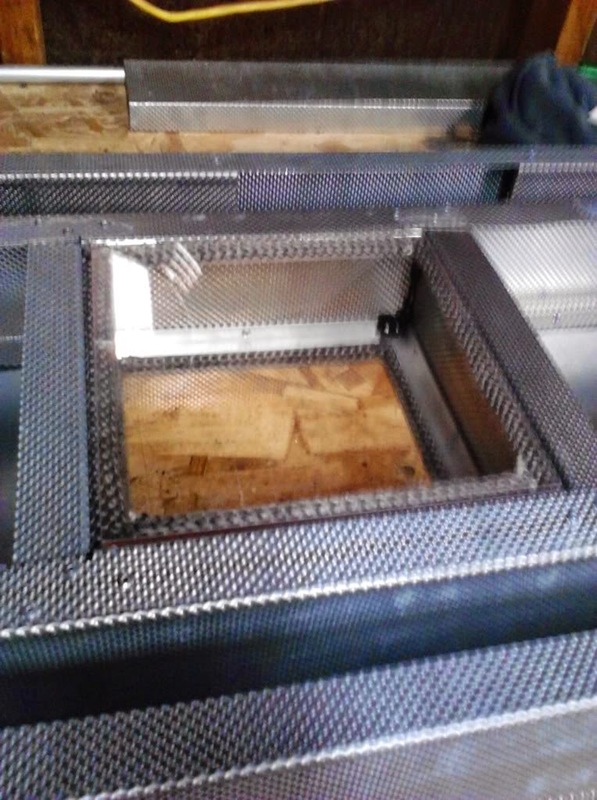 Before the oven door is installed, the front facing of the ovens studs is finished off with strips of sheet metal so there is a smooth surface. This could have been avoided if steel framing tracks were around the front of the oven instead of conventional steel studs as the framing tracks have a smooth surface.. Then a tadpole gasket is installed around the perimeter of the door opening and riveted into place. A tadpole gasket is used specifically for high heat environments and can withstand more than 1000 degrees F. You can order a tadpole gasket here. And the tadpole gasket is then installed in one continuous loop all the way around. The access door is then installed into the main door You can see that the access door uses 2 slide latches to keep it shut. Then the main door is installed using 4 door hinges. The final touches on the door are 2 of these Powertec Latch-action Toggle Clamps. These will keep the door shut tight on the door gasket. You can see these installed on the upper left picture. 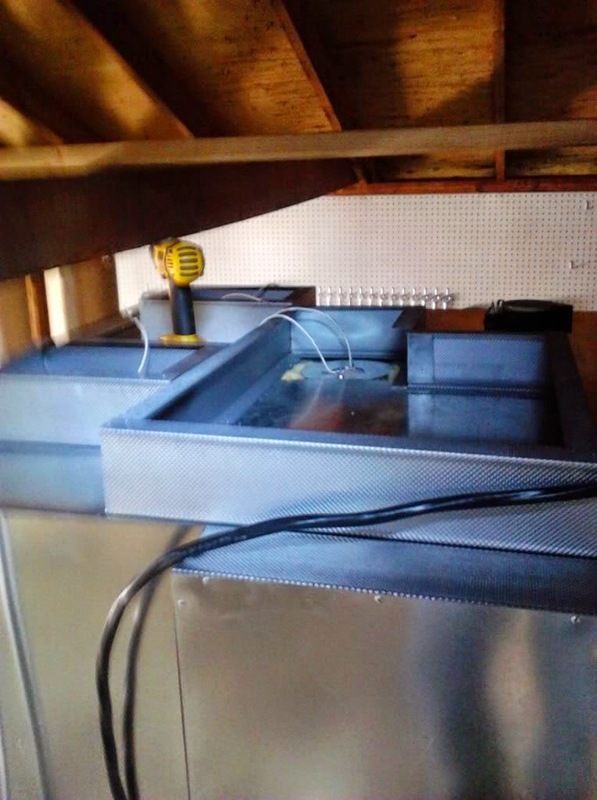 The heating element installation was shown in Part 1 of this oven build. This oven uses 4 2000 watt heating elements. You will need a way to control the heating elements. This is done by building (or buying) a control box. 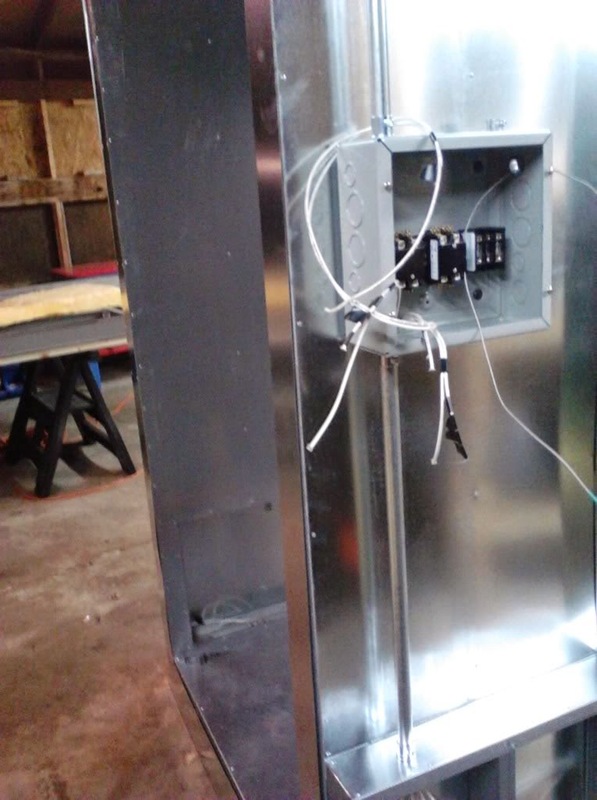 You can always salvage the control panel from an existing household oven and figure out how to wire it up to control multiple heating elements but if you are building your own powder coating oven and have already come this far, then you should build your own control box. The best thing about building your own is the use of a PID oven controller. Your standard household oven controls the heating element using an On/Off controller. Meaning that if you set your oven to 400, ideally it would keep the elements on until it reaches 400 degrees and then turn them on and off to stay at 400 degrees. Notice I said "ideally", your household oven will not cycle the elements on and off repeatedly. There is a target window. If you set your temperature to 400, it may turn the elements on until 425 degrees is reached and then turn them off. And once the oven drops to 375 degrees, it will turn them on again. You can see there is a temperature swing of 50 degrees using this method. If you want properly cured powder coated parts, this is not the way to go. A PID controller uses a 0-100% signal to the heating elements. 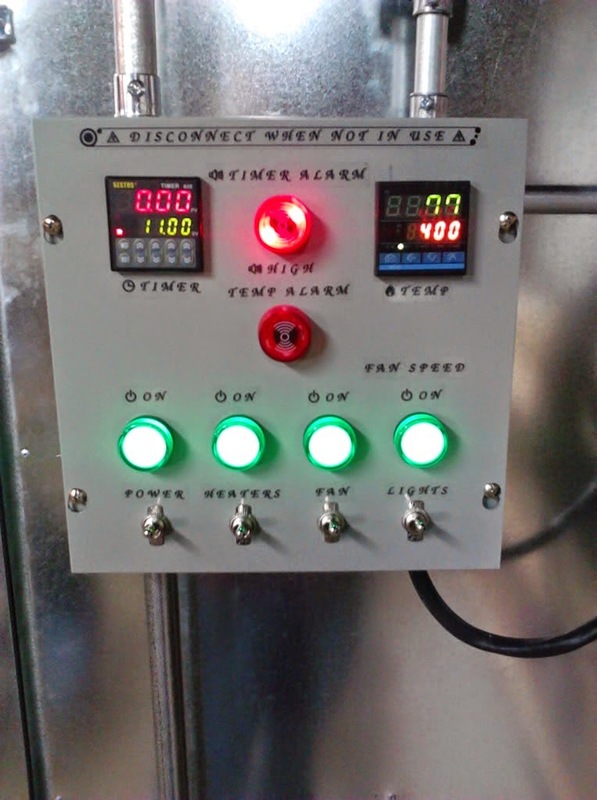 Using the PID controller, you will tune your powder coating oven so that a certain percentage = 400 degrees and it will maintain that signal throughout the curing process so you have a constant 400 degrees. If you want the full explanation, read this article. Another thing I want to point out is that not all PID controllers are created equally. There are lots of Chinese PID controllers on eBay that come with poor instructions and die very quickly, it is important to get a high quality PID controller. Trusted brands for PID controllers are Auber or Watlow, Watlow being the higher quality unit. Solid State Relay or Contactor? A PID controller cannot handle the amperage needed to control the heating elements directly so instead, a Solid State Relay, also called an SSR, or a Contactor is used in combination with the PID controller. Whether you decide to use a contractor or an SSR is a personal decision but for whichever one you choose, people generally swear by one or the other. However, when purchasing your PID controller, you must select one that is either compatible with a SSR or contactor. Multiple SSR's or contactors can be used depending on how many total watts are required for your heating elements. 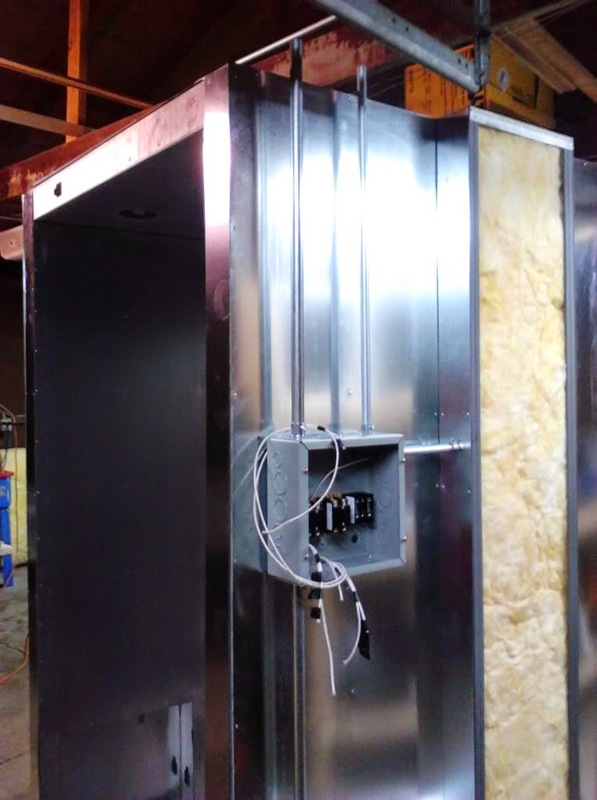 This oven build uses 2 contactors, each one operating 2 heating elements, totaling 4 heating elements. If using a solid state relay, it is very important to order a high quality unit or read reviews about the specific item you are ordering as there are many knock-off's out there that burn up quickly. Fotek, Watlow & Omega are all good brands however there are many counterfeit Fotek SSR's on eBay and Amazon. Another step that must be taken for the SSR is cooling. A SSR specific heatsink should be installed on the SSR with thermal paste and you can also go a step further and use a heatsink with a fan mounted on it (a CPU cooler). If you use a heatsink/fan combination, the fan will operate with DC power so to wire it up in your control box you will also need to incorporate an AC to DC converter board. A CPU cooler was not made to mount to a SSR but you can adapt them by drilling holes in the heatsink and mounting the SSR to it. If you decide to use a contactor, the cycle time must be increased in the PID controllers settings, otherwise the life of the contactor will be significantly shortened. You don't have to make your box identical to this one, but using the links above will give you an idea of what type of parts you will need and where to purchase them. The builder did not go into wiring schematics inside of the box so unfortunately, that will not be discussed in this article. There is tons of information about how to wire the control box and it is just a Google search away. A great place to help you select parts and wire your control box is the Caswell Plating Oven Building Forums, specifically this thread. Something to keep in mind is that you are dealing with AC electrical wiring which can kill you or burn your garage down. Please take this part of the oven build very seriously and do adequate research. These options are more expensive than piecing together your own control box but the benefit is that when you purchase one of these kits, a wiring diagram is included. 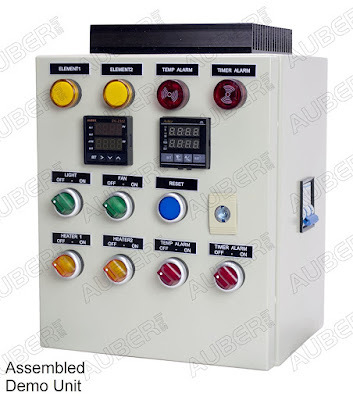 Auber instruments has put together several control box kits that you assemble yourself. There are two wattage classes available: up to 12,000 watts and up to 7,200 watts. 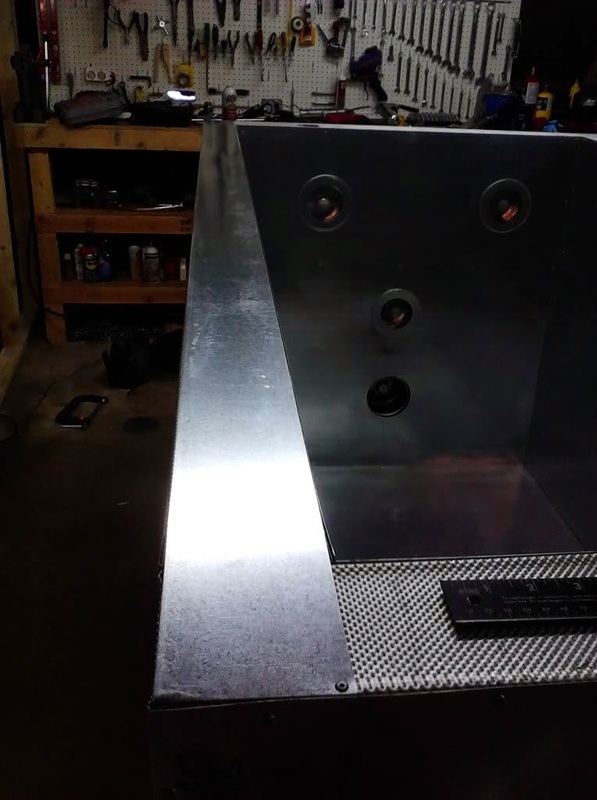 The 12,000 watt kit would be plenty for this oven build featured in this article. 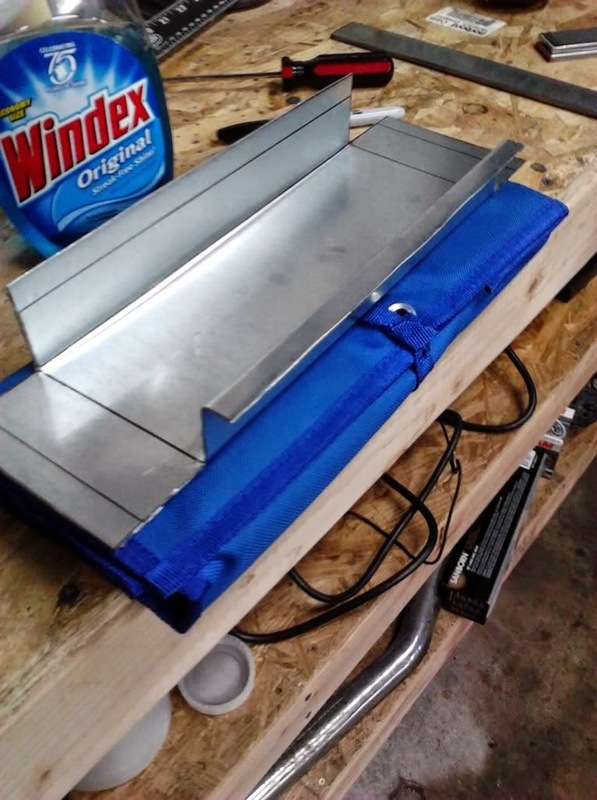 The 7200 watt kit would not be able to handle the 4 2000 watt heating elements mentioned in this specific oven build, but if you were building a slightly smaller oven or an oven with fewer or smaller heating elements, this would be a great option. The kits include just about everything you need for the oven control box and it includes a large heat sink to keep the solid state relay cool. Two newer kits are available that have a fan and light controller, however, your fan and light must have a 3 prong plug so that they can be plugged into the top of the box. If you would prefer to hard-wire your fan and lights into the box, it would be cheaper and cleaner to get one of the basic oven controller kits and add your own wiring and switches for fan and light control. Assembly is required. Click the links below for more info. When installing the control box on the oven, it is a good idea to use standoffs to space it away from the oven a little bit. If you install it directly on the oven, it can cause the electronics in the control box to heat up and kill them prematurely. 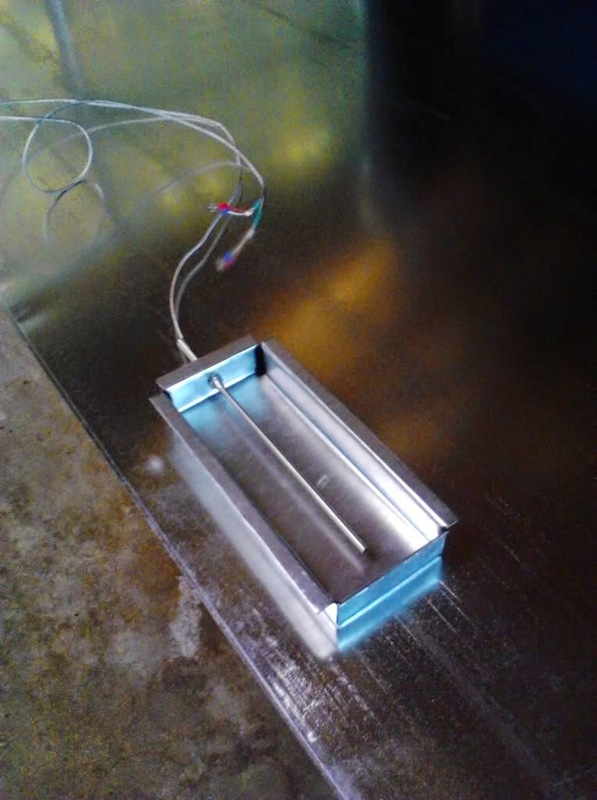 A 1/2" air gap between the control box and powder coating oven is enough to keep the box cool. 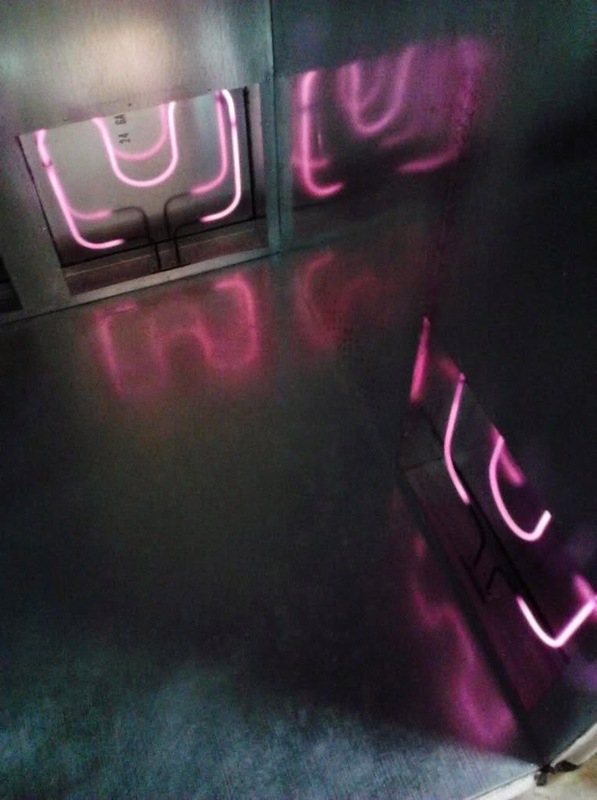 The powder coating oven uses a thermocouple which reads the temperature of the oven and connects to the PID controller. The PID controller has to know what the temperature is inside of the oven in order to regulate it. Considering every component of this oven is recessed, of course the thermocouple is too. Now that we have the control box and the heating elements installed, we need to wire them together. 14 gauge high-temp wire to connect to the individual components and pass through the wall. Once the wire is passed through the wall and is on the outside of the oven, you can switch to normal wiring which is much cheaper. 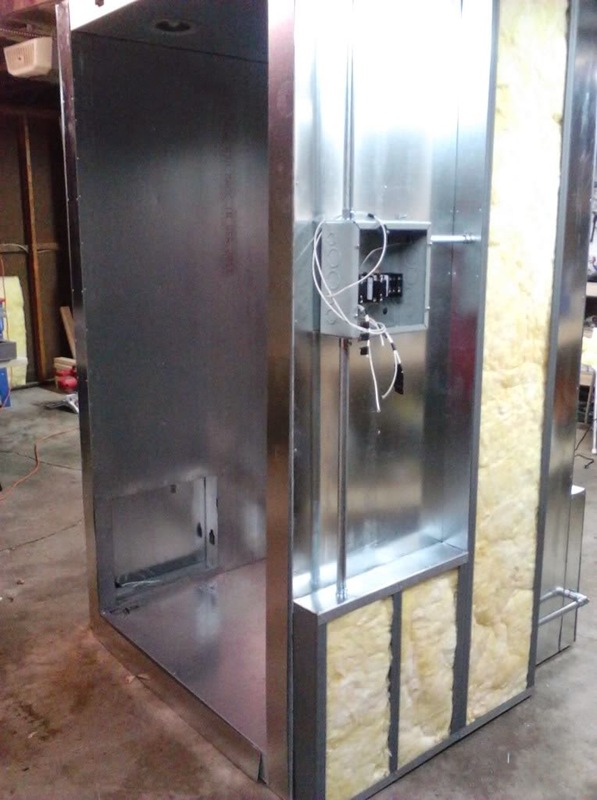 Here you can see the layout of the 4 recessed heating elements along with the insulated panels mounted behind them. After the high-temp wire is connected to the elements, the wire passes through the insulation panel and out of the side, drilling holes were necessary. 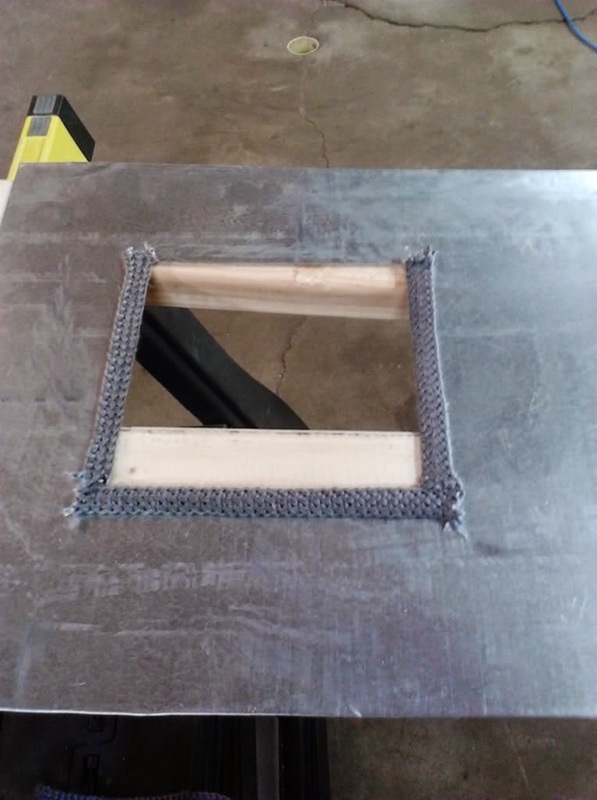 Whenever a wire passes through the sheet metal, you will need to use a bulkhead fitting around the hole to prevent the wire insulation from being cut by the sharp sheet metal. At the wire exit point from the insulation panel, a metal conduit fitting is used and then it travels through rigid metal conduit using 90 degree fittings until it reaches the control box. The conduit travels from the left oven wall heating element to the back heating element, then to the right oven wall heating element and then up to the control box. 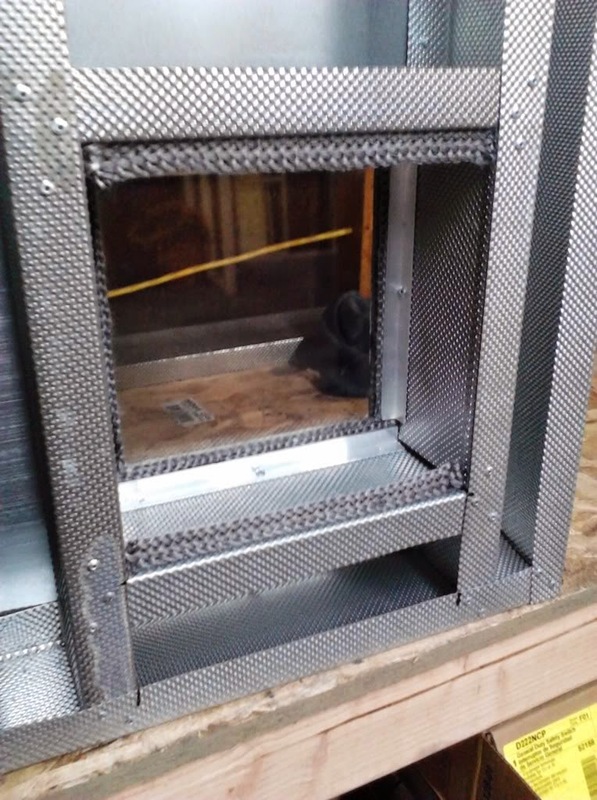 Also you can see now that the wiring is done, that the exterior of the oven has been skinned in 20 gauge sheet metal, the insulation has been installed into each of the insulation panels on the outside of the oven and the insulation panels have also been skinned in sheet metal. insulation panel to the left wall, through conduit, then through the convection duct insulation panel, the last bit of wiring from the right heating element is added to the bundle, then up to the control panel. Everything is now skinned in sheet metal except for the top, it has come a long way since that metal stud frame in Part 1. From here the last insulation panel on the top is skinned in sheet metal. So the powder coating oven build is now done. 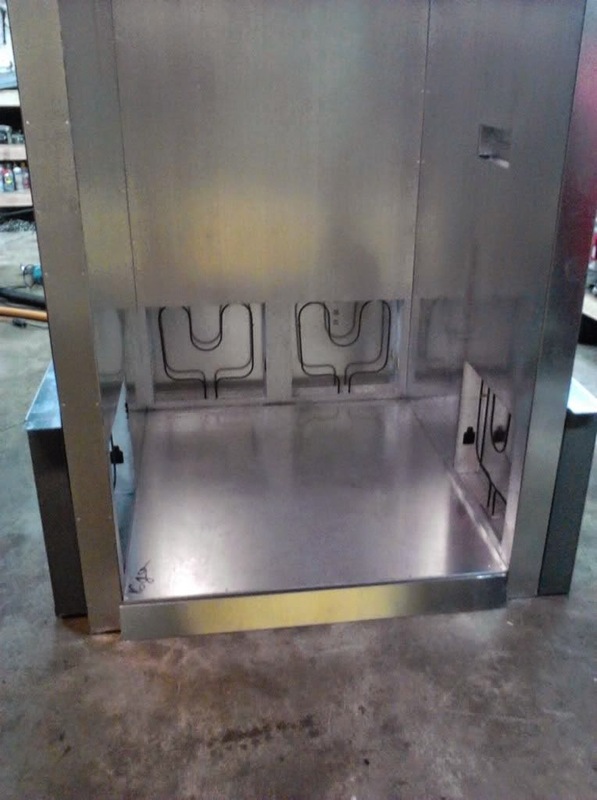 The builder of this oven at KNJ Custom Coating can now powder coat anything that will fit inside of this beautiful 6.5' tall x 3.4' deep x 3.4' wide powder coating oven. After the PID is tuned using the provided instructions, it is ready to go. The oven reaches 400 degrees is just under 20 minutes and the exterior sheet metal remains cool to the touch. 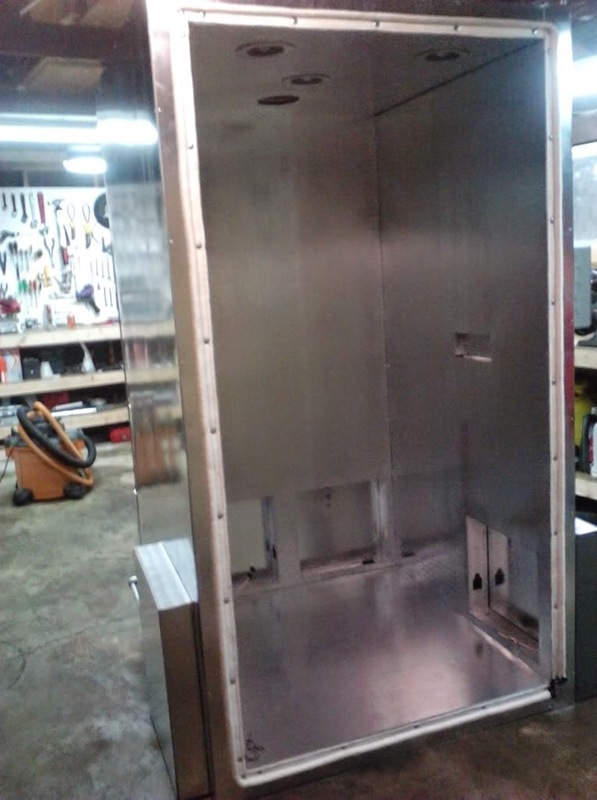 I want to thank you for reading through this powder coating oven build. 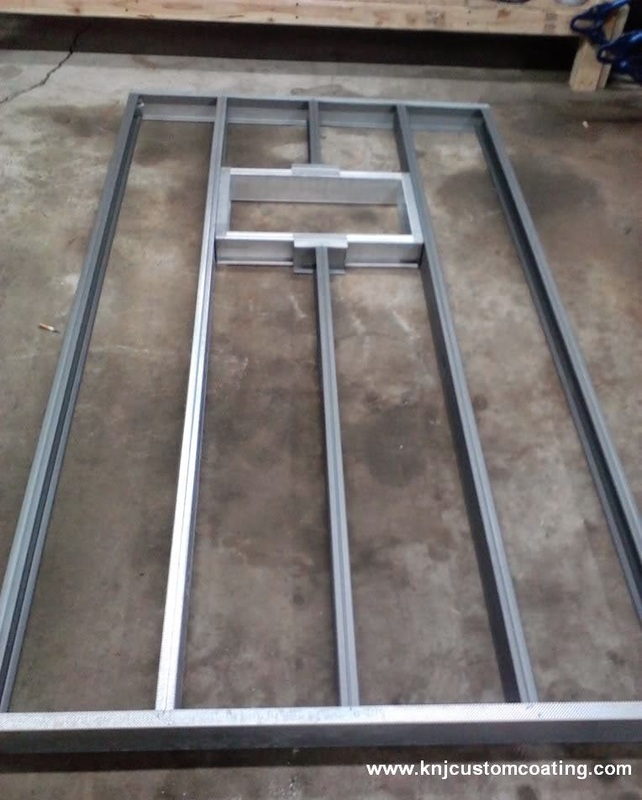 I hope you see that you can also build your own large powder coating oven and I really hope that this article and How to Build a Powder Coating Oven Part 1 help you achieve it. If you enjoyed this article, let me know, You can leave a comment below, or like Powder Coating: The Complete Guide on Facebook, Twitter, or Goolge+ or subscribe for email updates using the links in the upper right hand corner of the site. Stay tuned for the next article. Wow! This thing is so simple and clean and well thought out. I keep looking at the custom oven builders and wanting a size they don't make. This oven is the exact size I had in mind. I love the air circulation system. Party on Garth!! 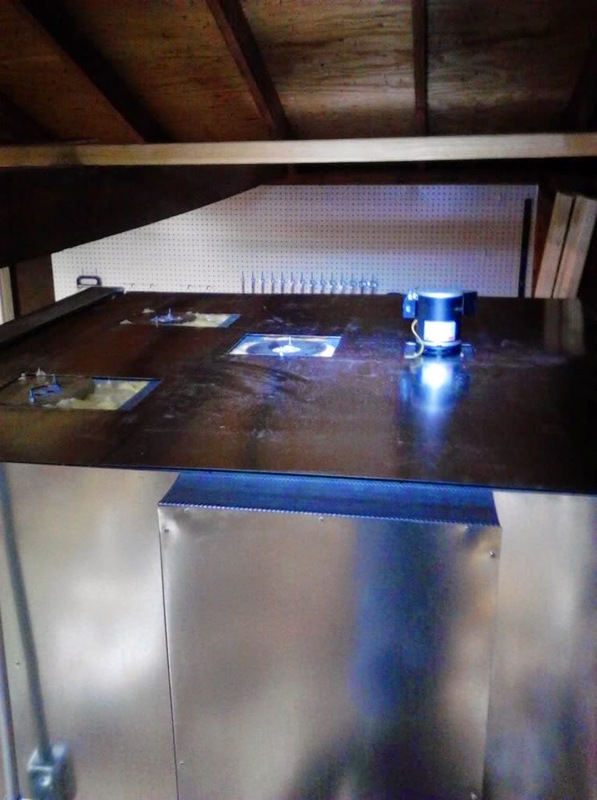 That is the great thing about building your own oven, you can build it to any size you want to accommodate your space and the parts you plan on coating. I do agree, this is a great oven build and all of the credit goes to the builder at KNJ coating. The air circulation system is also great. Thanks for the comment. Does anyone have the wiring diagram for this setup, I have built my oven and got all the gauges set up the same way as they are here but no wiring diagram? Yes can you please email me or post the wiring diagram please. Can anyone help w a wiring diagram? Some set up as photo but have no clue on the right wiring set up! Thanks! Can anyone help w a wiring diagram??? Great how too. That’s a totally doable project with this article. Thanks. Would you have a copy of the wiring diagram for the oven above. I ordered all the suggested parts from the links you added. So now I just need the Diagram. I thought about the heat crawl also and I have some 1/4" sheet white nylon (cutting board grade) and we will rip 1" strips, glue them onto the steel stud and simply use a longer rivet. Heat transfer issue solved....cheaply!! Shouldn't you isolate the outside sheet metal walls from the steel studs? Even 1" of duct board insulation would prevent the steel studs from thermally transferring the heat to the outside. I just think the whole thermal envelope could be better. how much does this oven wind up weighing? 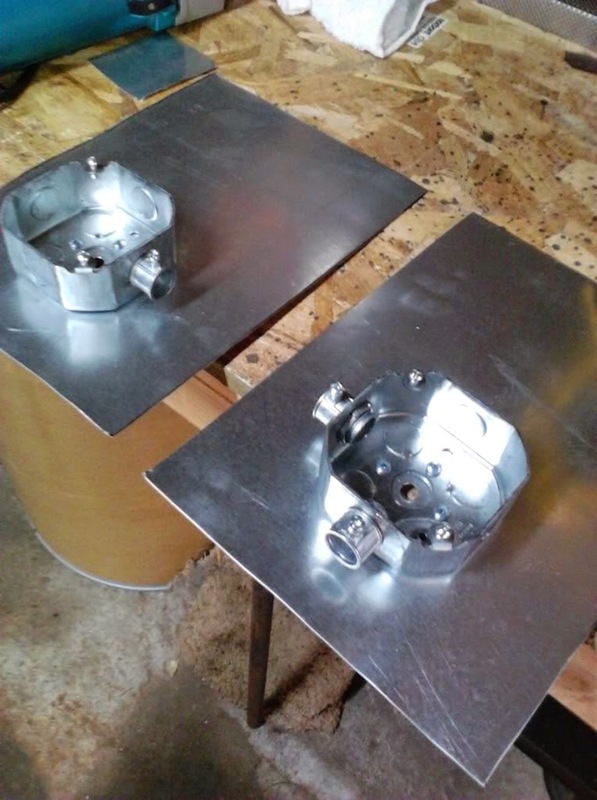 I plan to make one out of aluminum so it is easier to move around the shop when needed. 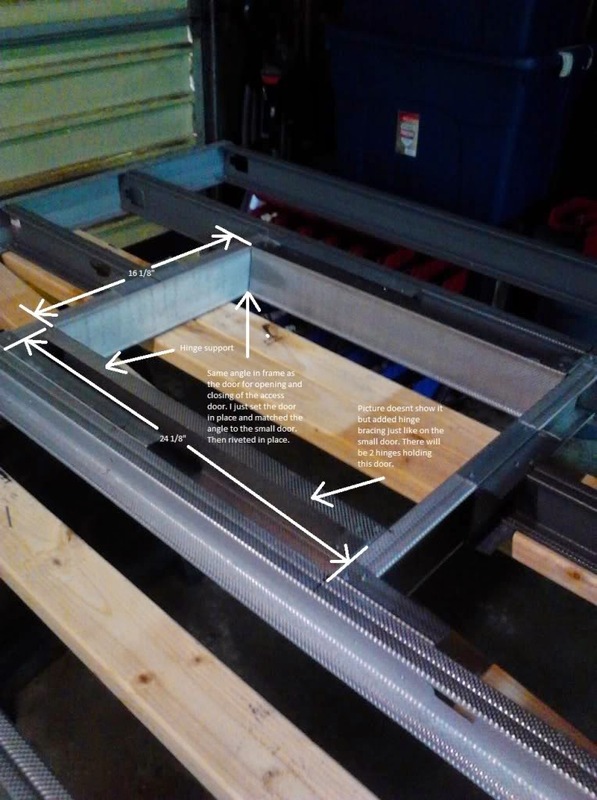 If you ever feature guest articles let me know ad I will try to document my aluminum oven build design. NIce thing about aluminum is you can easily get 5' wide sheet metal and is about 1/3 the weight. If you can think of a sturdy way to do it, insulating the steel studs from the outside sheet metal might have some benefits. Just don't forget that the outside sheet metal play a major structural role in tying the whole frame together and keeping it from flexing. I have honestly never seen the studs insulated from the walls. I'm sure it can be done, but I wouldn't sacrifice the support that the sheet metal provides. 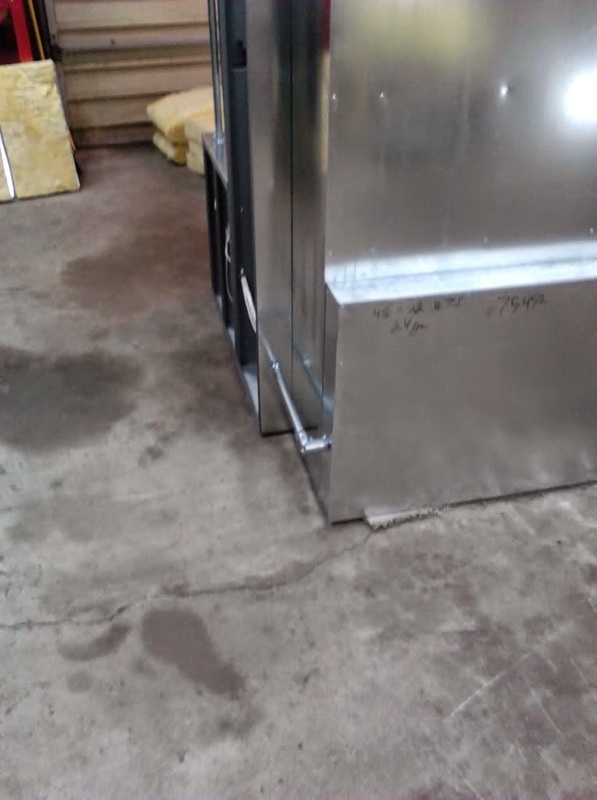 A lot of powder coating ovens are built this way with the sheet metal joining right up to the studs and I have never heard of issues arising from it, most of them remain cool to the touch on the outside of the oven(to an extent, you can put your hand on them and not burn yourself). 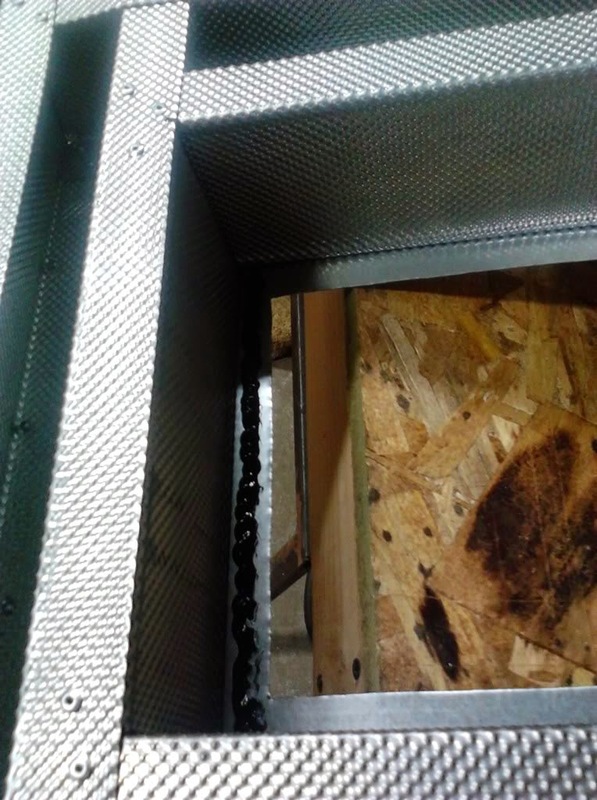 If you absolutely wanted the most insulation, you could add in the 1" of duct board to the exterior of the existing exterior skin and then skin over that with really light gauge sheet metal. Sorry, I do not know the weight of the oven after completion. It was not built to roll around, it is stationary so weight shouldn't be an issue. I am all for guest posts as long as the quality of the post is good. Aluminum should definitely make for a lighter oven, but once concern I might have, which may have already been addressed is how well aluminum conducts heat. Aluminum heats up and cools down much faster than steel, which may or may not affect the temperature stability inside the oven. I'm sure I am just over thinking it, but it is something to think about. I would definitely be interested in your results. 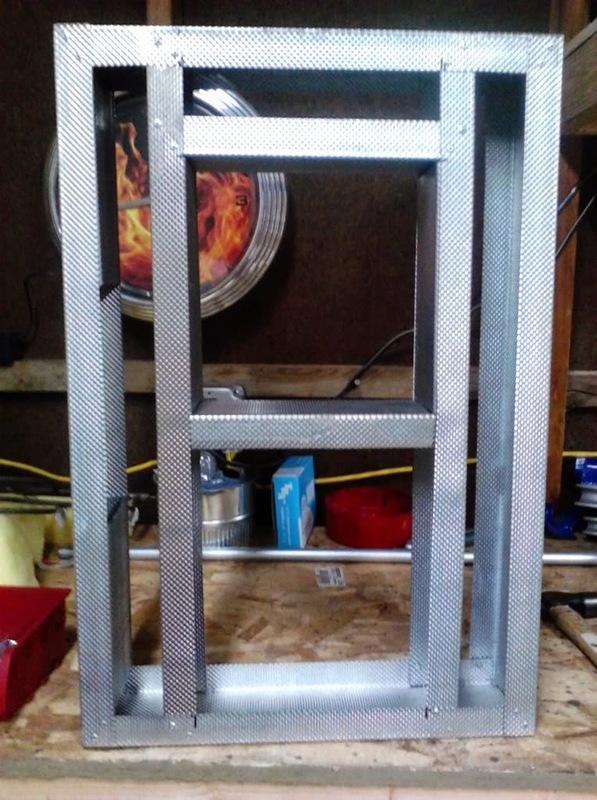 Thanks for posting, and if you are interested in doing a guest post when your oven build is off the ground, just let me know through the comment section here. How do place parts inside? do you use a special rack to hang them? I believe the builder of this oven uses a sliding style rack. The idea behind it is that you build a rack that can sit on top of a rolling cart. The rack sits at the same exact height as the floor of the oven. You roll the rack over to the oven and slide it off of the cart into the oven. That's definitely a valid question. The dimensions are for the inside of the oven, the "usable" space. Hello and Thank you for this great info. I want to build a oven 8 wide x 6 tall x 4 deep. Should I build it with 2 doors or 1 door on the 4 foot side and a peep window and small door on the 8 foot side? I will be only powder coating my Steel flat cutting from my CNC Plasma cutting table. Max cuts are 4x8'. 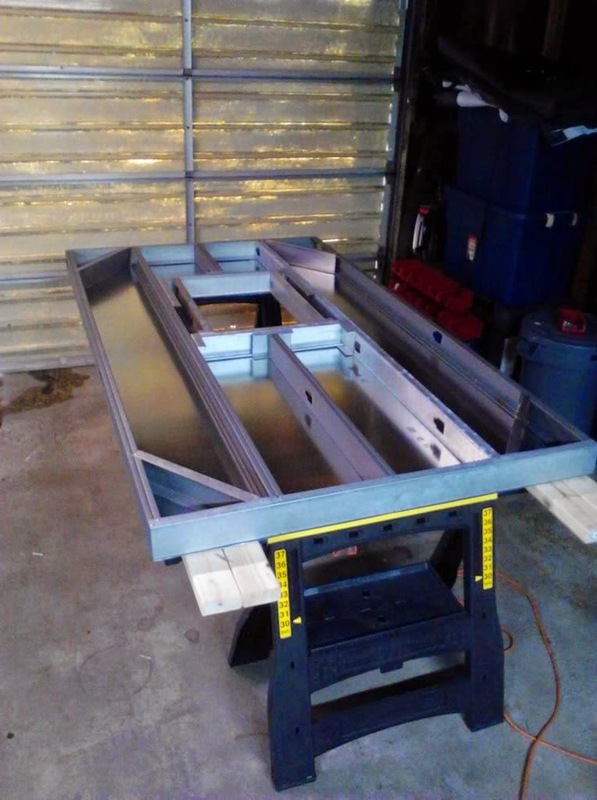 I will be building a roller rack to hang my steel from tobe coated and roll it into the oven. Make the Oven with out a 3.5" rise floor. Just put a 20 ga steel down for the floor. and roll the rack in and out. It will be sitting on concret. Then How will that gap under the door seal? rivet a gasket to the bottom of the door? and it will just sweep the floor? Will 4 - 2000wat heating elements heat this up to 400 deg? or do I need more? I found 3410 watt 240 v elements. Would that work? its allmost 15 amps each. Check out "How to build a powder coating part 1". The exact lights and fan used are linked on that page. I am going with what have on this build. Click on links and buy or go to home depot. Sean, awesome write up. I’m building pretty much the same oven. Do you have a good source for the heating elements? While they are all over the internet, they usually don’t list the wattage or size. I want them to be 2,000 Watts and small enough to fit in between the studs. I have yet to find a good source for heating elements, but if you search 2000 watt oven heating element on ebay, you will get tons of options, and most of them list the size. Newbie question here, would you advise heatining elements over infra red heating lamps? I would absolutely recommend heating elements over infrared lamps. A lamp that would heat up this oven can cost anywhere form $500-$1000 while heating elements cost peanuts in comparison. Plus, setting up controls for heating elements is very well documented on the web, especially on forums such as caswell plating, whereas controlling lamps to turn on and off is a very uncommon topic. I appreciate the comment, I definitely enjoyed writing this article as well. Thank you for reading! Fantastic write up and well executed oven build. Very nice. Didn't see it, might have missed it, what was the total cost to build an oven that size start to finish? I am actually in the process of building my first oven right now. I am just getting started and intend on doing rims for friends to start with, with lots of practice of course. Couldn't use a regular house oven due to space/size requirements for rims. I decided to use a heavy steel 55 gallon drum. Circular shape lets me do up to 20 inch rims one at a time by lowering them down into the oven from an above suspension system and cables and the oven doesn't take up much space at all in the garage. 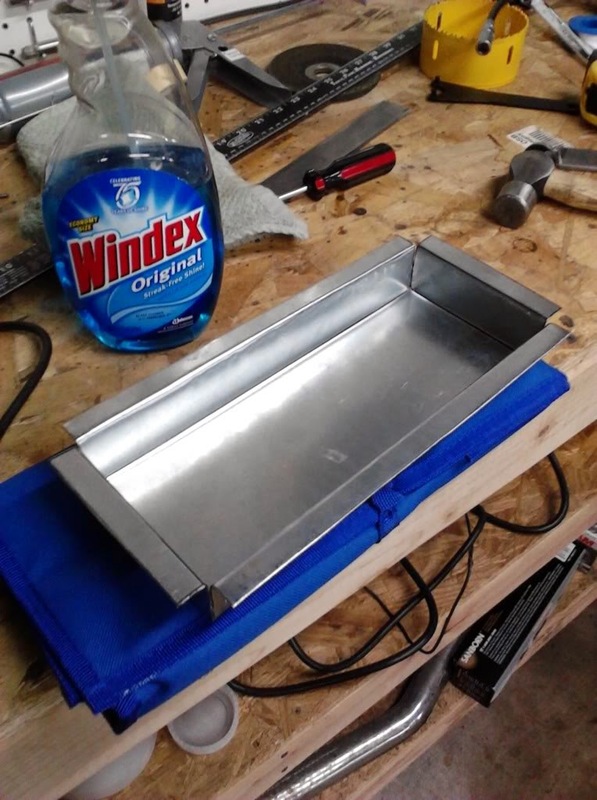 This page is an awesome resource for the beginner powder coater. Thanks!!! An exhaust fan is not necessary. If you are seeing fans used on builds, it is most likely to circulate the air inside of the oven in order to evenly distribute the heat. Awesome build ! One question are u running all the elements in series then into just one controller ? Unfortunately, I wasn't provided with a schematic or many detailed pictures from the oven builder, but I do know that there is one controller, and the elements are wired in parallel to a bus bar and then to the controller. Hi Sean, I think this post is a must read. We also do custom powder coating services and intend to provide more information about the topic. Hope you can also hop on our websiteand all the best on your blog. Hi, I was wondering if you could use sheet metal screws and instead of all the rivets? It just seems like if you ever had to take it apart to repair something, drilling all the rivets out is extra work. Not to mention extra work to build this entire oven. I haven't seen an oven entirely built with sheet metal screws yet, but I have seen some that are constructed mostly with rivets, but then sheet metal screws were used on just the exterior panels for easier servicing. I am not an expert on fasteners, but it seems there is very little contact area for the sheet metal screw to bite into considering the thin gauge of the sheet metal and studs used in the oven. My experience with sheet metal screws is that they start off nice and tight, but over time, they seem to loosen up due to vibrations. What configuration or setting did you use specifically for the Auber PID. 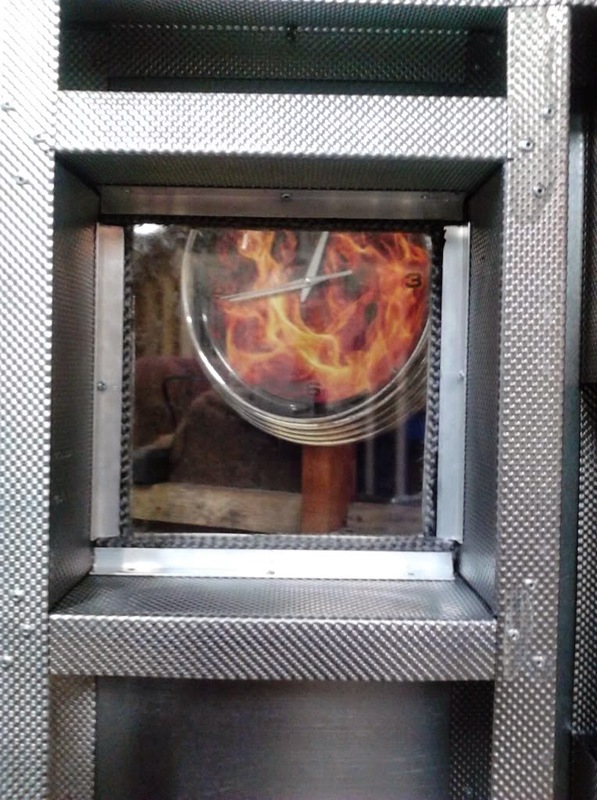 I am making an heat treating oven which will use heat up to 350 degree for 90-120 minutes. I am having troubles with the PID not staying on all of the time it keep cycling on and off for up to 5 seconds at a time. Any input would be greatly appreciated. Now you output you need to determine if it is analog or discrete. Analog output is usually 4-20ma and or 0-10v then the device running the coils would half to be analog since the controller cannot handle high power. Analog is very expensive more than likely you have a relay or scr which are discrete which means that it is either on or off no in between. 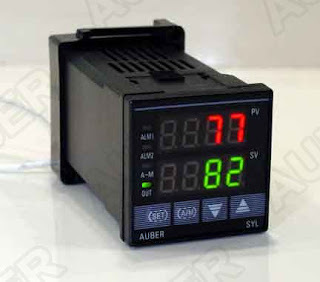 The pic controller will change the duty cycle which is the ratio of the amount of time that it is on compared to time that it is off to maintain temp. It is common for the controller to over shoot with initial heating but only by a few degrease then it should maintain. First of all thanks for posting such a great article, I Would like to know how to decide the thickness of Insulation for 400 degree C and can I use glavanised sheet for 400 DegreeC . Don't mean to sound stupid but didn't really get the angle cuts for the door. Could you explain it a little more. Not stupid at all, it is difficult to comprehend from the pictures. If you were to stand the mini-door up on a table and look at it from the top down, the shape should be a trapezoid. The shorter side being on the inside of the door and the longer side being on the outside of the door. However, not as exaggerated as a conventional trapezoid. It just needs a slight angle to be able to open and close. If the door were completely rectangular along with the opening and there was a very tiny gap, the door would not be able to open. Instead of a squared off element area, as depicted, I angled the metal at a 7 degree angle for the heat to roll out easier. I used the caping material instead of the regular studs, the cut easier and may be formed to fit angles and 20 cents cheaped with the same results. I allowed 3 extra inches for the angle to burner ratio, basically a total of 5-6 inches from the element to the corner of the angled piece. Wished I could insert a pic. Hello Sean Castle... 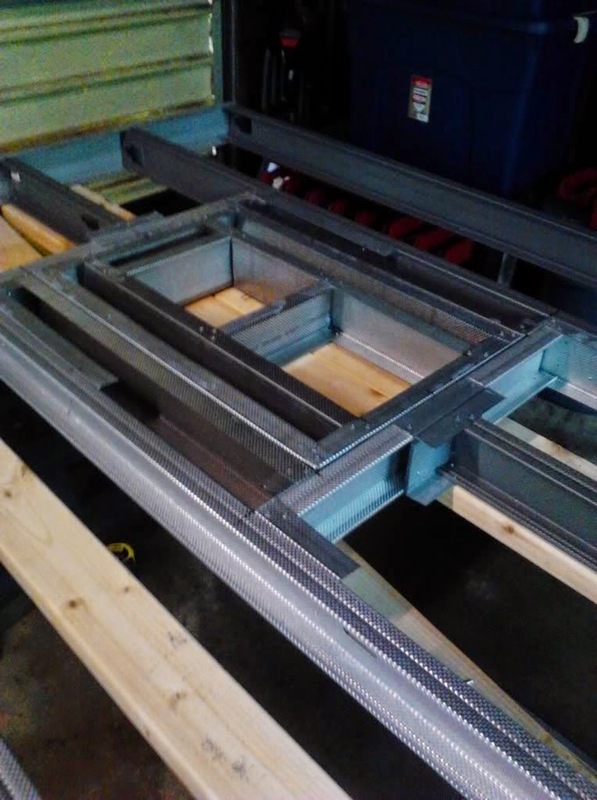 I finished making my oven as far as the framing and the doors... Im now at the part to wire up everything into the box. The link you give http://forum.caswellplating.com/oven-building-forum/11558-oven-controls-build.html doesn't seem to exist anymore. So now i am stuck. I have 0 experience in wiring or electricity. Can you please give me another link that will show me how to wire all of this up into the box please. Thank you very much and have a great day. That is unfortunate that the page was taken down, it has some really good info. Thanks for bringing it to my attention also. I would highly recommend joining the Caswell plating forums as they have an active oven building sub-forum. There are some members there that are way more knowledgeable at me that can explain how to wire the oven. I would suggest making a thread and explaining what your exact equipment is (elements, pid, SSR/contactor, timer, etc.) and they should be able to walk you through it. In the mean time, I will work on finding a new source to link to. Here is the correct link to the Caswell controls box build. The original was lost when Caswell updated their forum software. 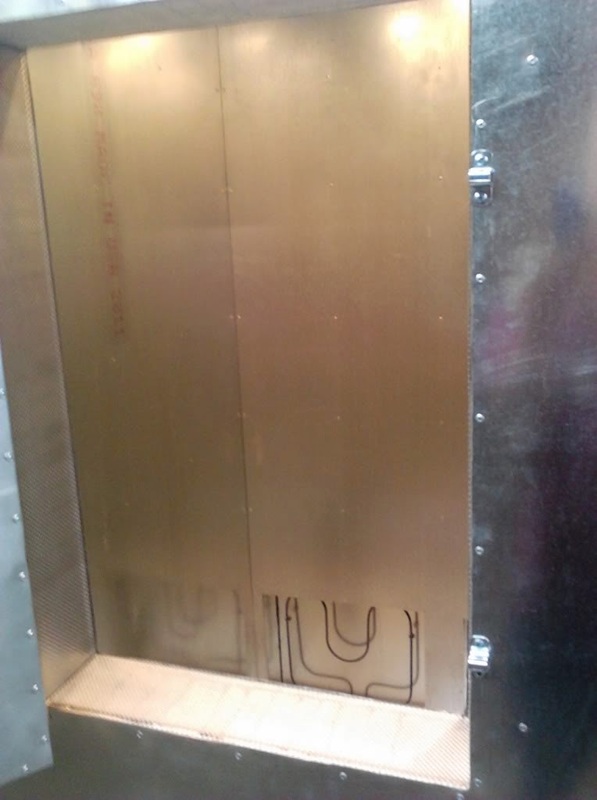 Oh hey, that's pretty cool how you can build your own powder coating oven. From where would the powder come from when you turn it on? This is something that sure got my attention and what I would like to know more about. The powder comes from the powder coating gun before you place the item in the oven. The oven just bakes the powder, it doesn't apply it. do we really need a blower at 310 cfm or a 159 cfm dayton will do the job ? The 310CFM blower moves the air about 4 times a minute in an oven this size so you are ensured that the temperature remains consistent throughout the entire oven. The 159CFM blower should change the air about 2 times per minute so its not as good as the 310 but you should still have pretty consistent temps. There is not a huge price difference between the two but if you are on a very tight budget, the 159cfm blower will work. could you install 2 150 cfm blowers , one on each side at top ? I already have one and could easily add another one . Sean. Have started skinning the outside and wanted to be sure I did not need to add any supports in there for the door hinges. The description just says that you rivet the hinges in place. Building this is my first experience with rivets. Do they make them big enough to hold those big hinges? I have heard no complaints of the door sagging on this particular oven build but I have seen it brought up in the past. If you want to ensure that your door will not sag, I have seen people use angle iron to beef up the door hinge side of the oven. 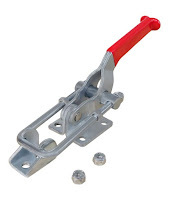 Then you have the option of using nuts and bolts through the angle iron and the door hinges. 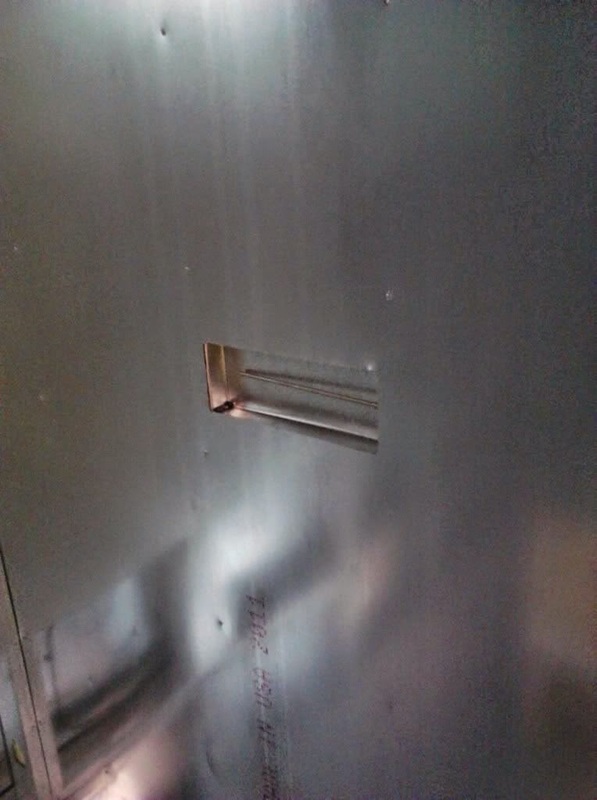 If you decide to use rivets and are worried about the strength, you can always drill more holes through the door hinge to allow for more rivets. Hi Sean, do you have a wiring diagram for this unite, I am not an electrician and i have the same setup as your box? Hi Sean. Just read your entire article. It is very informative, to the point, and well written Thanks so much for taking the time to document the build. I am also in process of building a similar sized oven and your article is a tremendous resource! That's great to hear and thank you for your comment. Good luck on your oven build! Yes, you can increase the percentage if your oven is not getting up to temp although I am hoping 80% is enough for you to reach your desired temp, otherwise you may need more heating elements. 80% would mean the heating element is on for 80% of the time and off for 20%. For example, if you are using 100 second intervals, it would be on for 80 seconds, off for 20, then back on for 80 seconds. Hello. Why Need a hinged window. Very complicated to make. It's okay to have a window to watch what's going on inside. If you have an infrared thermometer You just need three holes with a diameter of 4 inches. arranged vertically. So you will not run temperature.And we will monitor the process of paint. The holes can be of valves / small plugs of steel. / My luck is. And you can look for a ready from Broken Fern soda or snacks can use for construction. You do not need a hinged mini-door with a window, that was just what was preferred for this oven build. When someone puts a lot of time and money into an oven build, they want to get it just right to suit their powder coating. In this case, the hinged mini-door allows the coater to easily fit their whole hand and IR thermometer in the window to point where they need. Using holes and plugs works as well and there is nothing wrong with going that route. Awesome write up man. I was just thinking last night about options and ways to build an oven. I already had the idea of using metal wall studs and all, but this article put it all into better explanation with the pictures and all. I've been using a reg household oven for almost a year and have turned away thousands of dollars worth of work because it wouldn't fit in my oven. This shouldn't take long to build and I can start bringing in some of those bigger jobs. I'm a sheetmetal fab guy by trade, so it shouldn't be hard at all! Only issue for me will be the wiring. I've got the Caswell link saved as well, so maybe I can figure it out. I just think ill make mine a bit bigger. Like 6x4 and 3 deep. Same general oven, just a touch bigger. Thanks man! Helps tremendously! Thanks, a larger oven is a great investment for powder coating and since you already do sheet metal, you should have no issues at all. I am trying to get a wiring diagram drawn up for the control box but I have had no time to get around to it. It is in the plans but I don't known when it will actually happen. Some of the guys on the Caswell forum are very knowledgeable about the wiring aspect, much more so than me so if you need any help, I would definitely make an account and post up on there. Good luck with the build! My oven is almost complete, modeled after this one. I have a question about insulating around the blower motor on top. After looking at the motor cooler fan arrangement, I would assume it is best to leave an open air space around the motor and just accept any heat loss from that area to protect the motor. I cant really tell from the pictures, but am I correct that you did not put any insulation immediately around the motor? Thanks again for the write up. Extremely helpful. Only thing I am doing different is framing the door and opening with 11 ga for hinge/ latch support and to stiffen against sagging. Yes you are correct, if you look closely at the pics, you can see the the motor does not get covered with any insulation at all and that it extends out of the top of top panel. 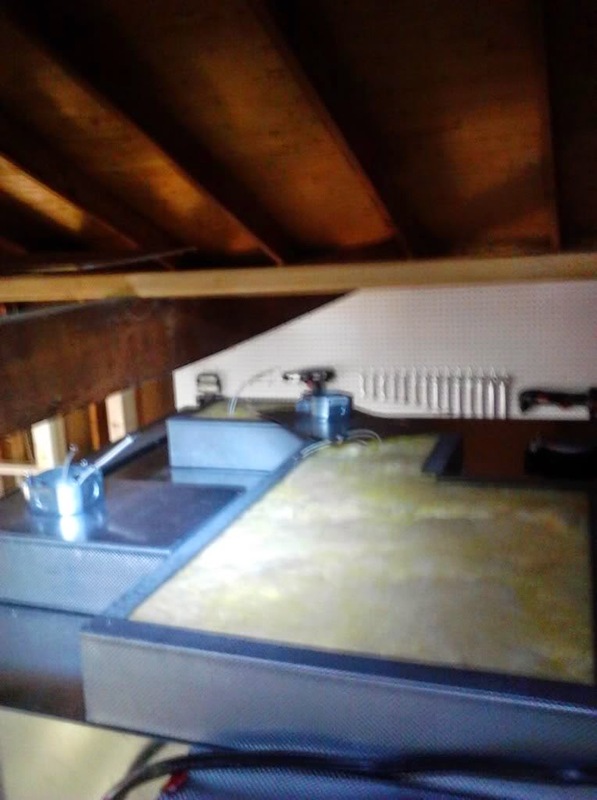 Its kind of hard to see in the pictures, but if you look closely at the top panel where the electrical junction boxes where installed on the lights, you can see that there is an framed off L-shaped area of insulation and that the motor is outside of this area and in open air. It is never a bad idea to reinforce the door and hinge. Good luck on the rest of the build, I'm glad the guide helped you. Yes, fiberglass insulation is adequate. The heat retention of fiberglass is not as good as rock wool insulation but many people use fiberglass for oven builds. 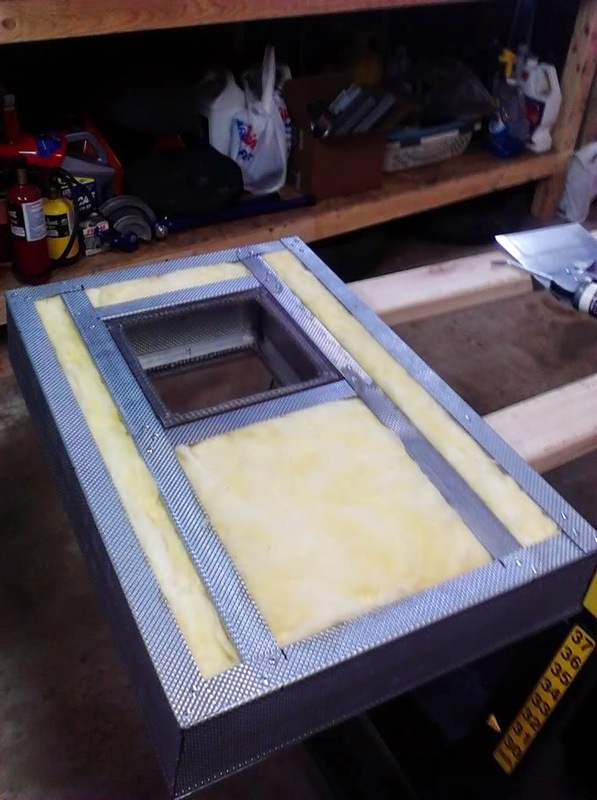 This oven build uses R-13 unfaced fiberglass insulation. What are your thoughts on using propane as the heat source? It has definitely been done. A relatively cheap and easy method I see commonly is using a propane torpedo style heater directed into the powder coating oven. under your "control box" section is the solid state relay required ?, I see it in the picture along with a probe(?) and pid controller. or is just the pd controller required, and thermocoupler ? There are 2 methods that can be used. One is a solid state relay and the other is a contactor. PID's will be specific to one or the other. You will need one or the other. If you go the route of the solid state relay, it is very important to keep it cool. This can be done by using a vertical fin heatsink with thermal compound and possibly a fan. Stay away from the cheaper brands as they tend to burn up very quickly. Good brands are FOTEK or Omega. In my opinion, a properly set up quality solid state relay would be better than a contactor. ohhhh.....I ordered the auber syl-2342 pid controller, so what method would that be ? I also ordered the 1 X K Type 5cm Long Probe Thermocouple Sensor or Temperature Controller that you posted above, does that work with the PID I ordered ? That PID is compatible with a contactor. Nothing wrong with that, it's just a different method than a solid state relay. 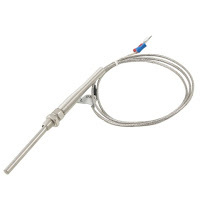 The thermocouple you have is compatible with either method. Sean how did you get the time alarm to sounds the buzzer and light the LED? I am using one shot mode vs cycle mode but when the timer ends no lights or sounds out of the warning light/buzzer. I am following this http://www.sestos-hk.com/english/download/b2e-en.pdf for instructions which is the how to set up. Timer works fine just nothing when the time expires. I have tried everything I can think of. The final wiring diagram that was posted on the last page of the thread is when he was able to get the alarm to operate correctly(Inkbird and Sestos timers are the same thing). The only confusing part is that he is not in the US and therefore does not have 2 hot wires. I hope it helps though. Just about ready to wrap up my build. The thing is I'm not understanding the 120V/220V working together. There are two heating elements in the oven that are 2500W's each. Yet the blowers and the lights run off 110. Any advise on this you can provide would be great. Just not understanding if the main power supply is 220/240 30amps how the lights and the blowers are going to work. This is a simplified explanation. For the oven to have the lights and fan, the wiring going into the oven must be a 3 wire + 1 ground wire. The 4 wires together consist of 2 hot wires each carrying 120VAC each, the neutral wire, and the ground wire. The heating elements are able to receive 240V by connecting them to both hot wires(240V total) while the other components in the oven(lights/fan) are only connected to 1 hot wire(120V total). 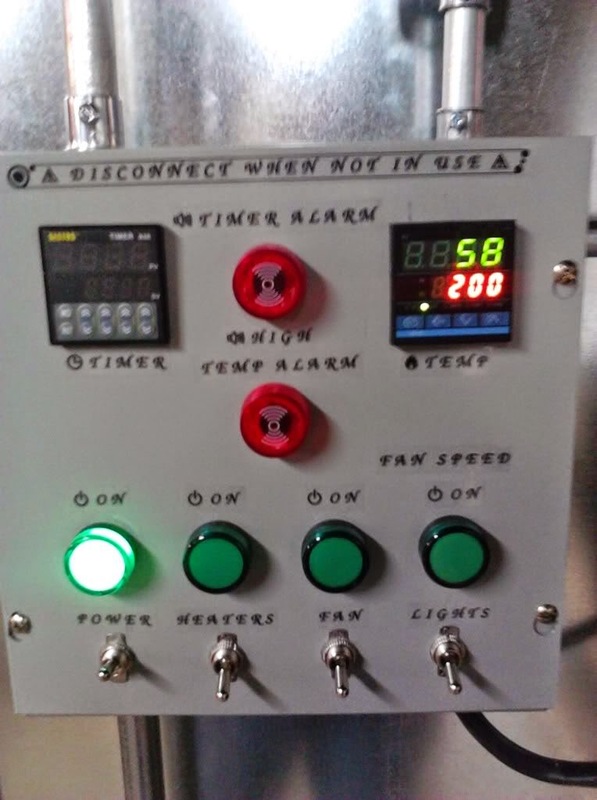 There is a wiring diagram about halfway down this page: http://forum.caswellplating.com/forum/powder-coating-questions/oven-building-forum/11867-oven-controls-build that may be able to help you out a little bit more with the understanding. Thanks Sean! I will follow your instructions and check out the link. 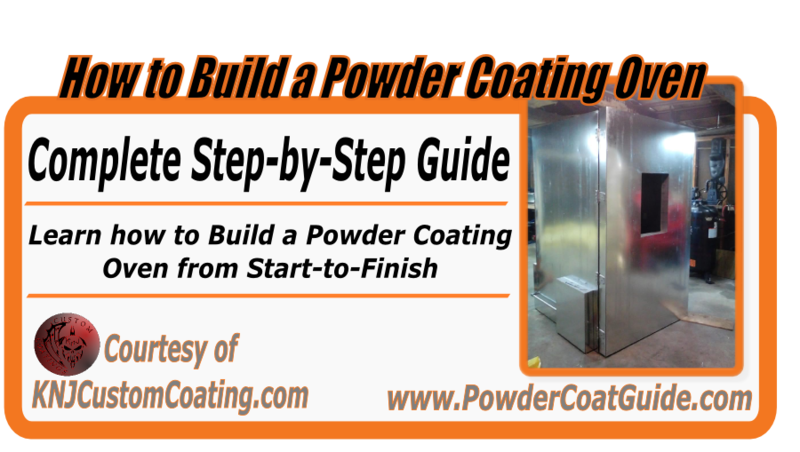 I am currently in the works of creating my own powder coating oven and this has been very helpful! Thank you for that! However, I am having an issue with the sheet metal. I see that you used 20g, but there are many types of 20g sheet metal. What would be the specific kind I should use? You're welcome, I'm happy it's helped you so far. As far as the type of sheet metal, most people that build their oven's do not get any more specific than choosing steel, galvanized steel, or stainless steel. There are, of course, many varieties of each of these but it is not as much of a concern. I would find a sheet metal supplier in your area and get in touch with them for their recommendation. Price vs. quality will be the big factor but I would assume most oven builders use something like A366 or 1018 mild steel. Hope that helps! Thank you for the info! I do have one other concern I have been trying figure out before getting to far into the build and realize it will not work. Let me see if you have any knowledge on this. I am on a 120V circuit (I wish I could use 240V but this is not an option..). So, I found this heating element I was thinking of using two of. 120V 900w each. If my oven is 66"H x 28.5"D x 21"W, will two of the heating elements get me to 450 degrees? According to the BTU calculator this should work, but someone with real world knowledge may say differently. Also, my dimensions listed above is the "usable space" inside the oven. I recently spoke with someone that is very knowledgable when it comes to building ovens. he said that a good rule of thumb is to ignore the calculator and aim for 100-150 watts per cubic feet of oven. I have recently included that information in the oven building article. Your proposed oven would have about 23 cubic feet of interior oven space so the minimum wattage you would need is 2300 watts and that is if you live in a warm area. Two 900 watt heating elements doesn't quite hit that figure. If you went that route, it may take a very long time to get up to temp or it may never get up to temp. Realistically, you'll most likely have to decrease the oven size or find a way to access a 240v circuit. Before you make any purchases, I would recommend that you sign up for the Caswell Plating forums and post this question in the oven building section. 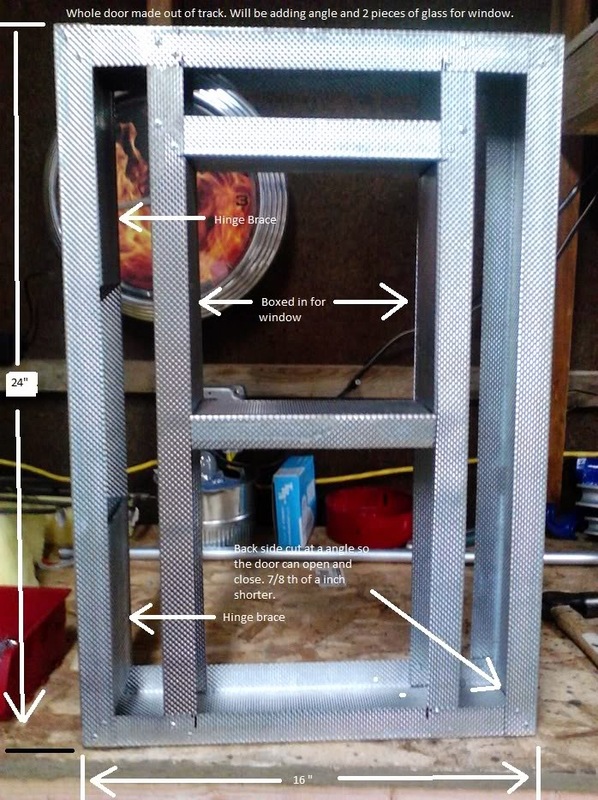 Great article on diy oven building! Would you be interested in drawing up some basic dimensions for me to build a 4 metre length x 3 metre wide x 2.5 metre high oven? For a fee of course? Contact me @ copap1@yahoo.com.au Thanks. Is your build 4 x 4 x 7 outside measurements ? I saw 3.4 x3.4 x6.5 inside .That makes around 75 cu ft . 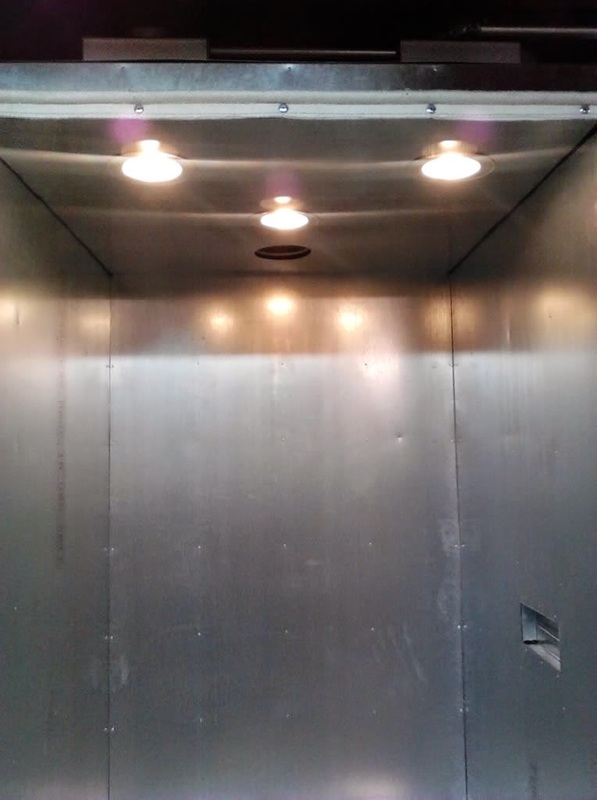 So your 8000w heaters keeps you in line with your 100 watts per cu ft . Mine will be 4 x 3 x 8 outside so I should be real close to your cu ft and 2000w x 4 units should work. 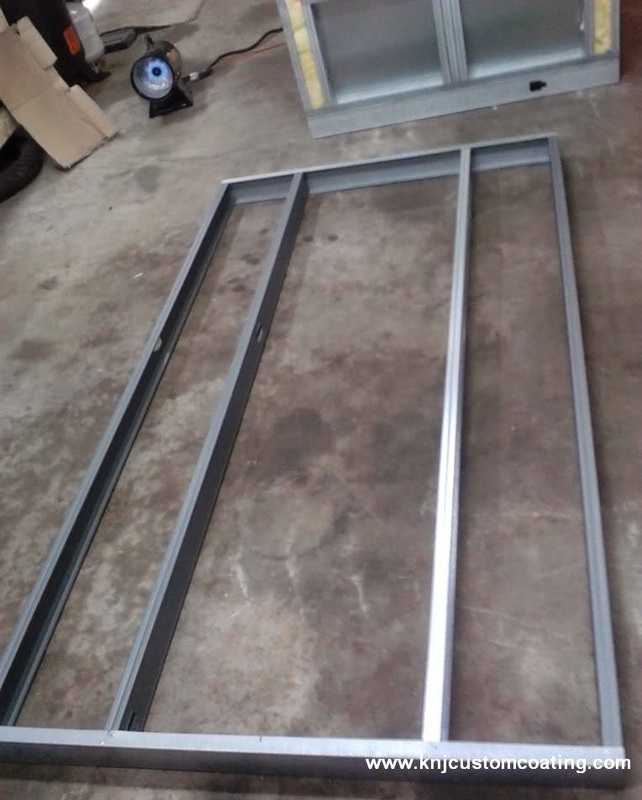 I was planing to use a barn door track in the top to roll items in and out from a hanger . Have you tried anything like this? The concern I have is any grease in roller wheels will melt out. I did see where some used rollers at the bottom on a stand. I guess I dont want any contaminants in the cabinet. Any thoughts on loading large heavy items ? My suggestion would be to avoid angling anything heavy from the ceiling of the oven if you are using the metal stud design. 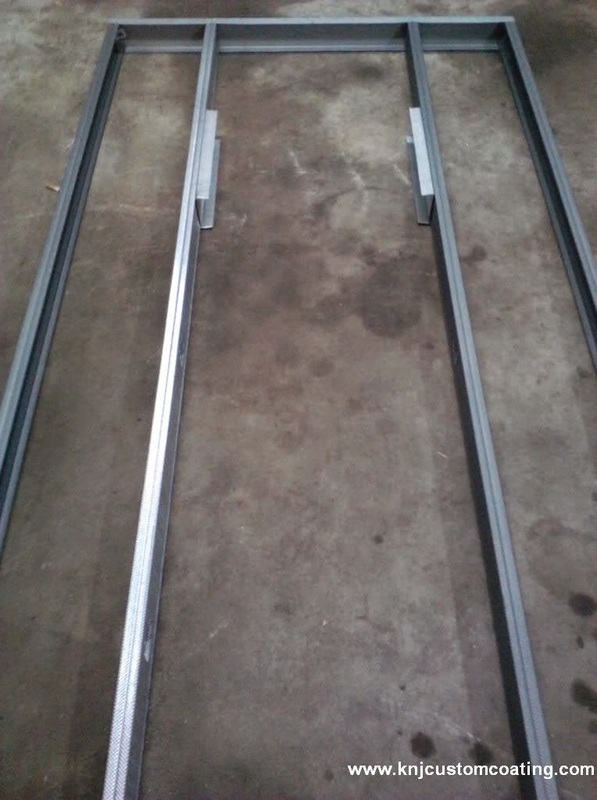 If you want to hand from a top track I would build the top out of 1"x 4" x 14 ga rectangular tubing for strength. I also agree with you about grease from any wheel bearings contaminating what you are coating if mounted above. If you go with the metal stud design, Just build a rack for anything heavy and put it on metal casters to roll in a Ned out of the oven. You can spray your parts from the same rack and avoid handling problems. My oven is smaller at 2.5 x 2.5 x 6. Would the same cfm fan need to be used or could a smaller one be used and still be effective? Can u use water heater elements instead of the oven elements? Lots of water heater elements go zap when not in water. This is a problem in campers when they turn them on and forget to have water filled in tank. Is the wiring for the elements run through the floor base? Has to be. Looking at the pics. So I take it, the elements are then wired up and then mounted to the floor base. Then the wires are run through the framing into the insulation panel and out into the conduit to the control box. The wiring for the elements runs through the metal conduit on the exterior of the oven. This way, it is easily serviceable. Do you have a wiring diagram available on how to wire up 4 elements? you oven don't have any exhaust hole, I wonder how many time take it cold down? If I wanted to build one but with gas, couldn't I tear apart a old, well working, gas oven and use all those parts, install a cirulating fan & go? I don't want to run with electricity. Great build. 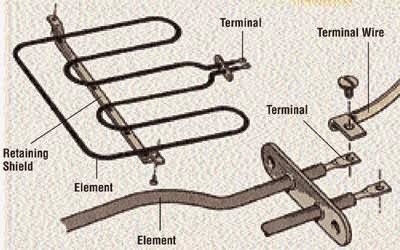 I'm trying to use this concept to make a batch oven, I can't have those heating elements direct to my product, Now, Can I use them for a circulating air oven? Thanks and great design. This is an amazing step by step guide and it is very easy to understand and read. Great work! Awesome work. Thank you for the info. I have everything done from spray booth to oven and am stuck on programming the Auber 2342 with contactors. Is there a guide to set this up? I mean a normal guide that uses words like temperature. The process of decoding the instructions into usefull English is ridiculous. Help. Hi, excellent article all round, I'm about start my build and would like to buy the 7,200 watt controller kit but your link above does'nt seem to have any, where else can I purchase ? Thanks for the terrific article. Extremely well written & informative. You do some excellent work! Now... not to beat a dead horse here .... but did you ever get around to making up a wiring diagram for this oven.... as built? Regardless, thanks for all the hard work into putting out this article. Regards, John W.
This is incredible! I feel like if I had something like this I would finally be able to get a lot of projects done that I have been meaning too. Can you put multiple items in here at once? Do you feel that there are some jobs that this can't handle and you would need to call in a professional? First off thanks for sharing all this info!!!!!!! I'm building my oven as we speak. I have a few question if you could help answer them. 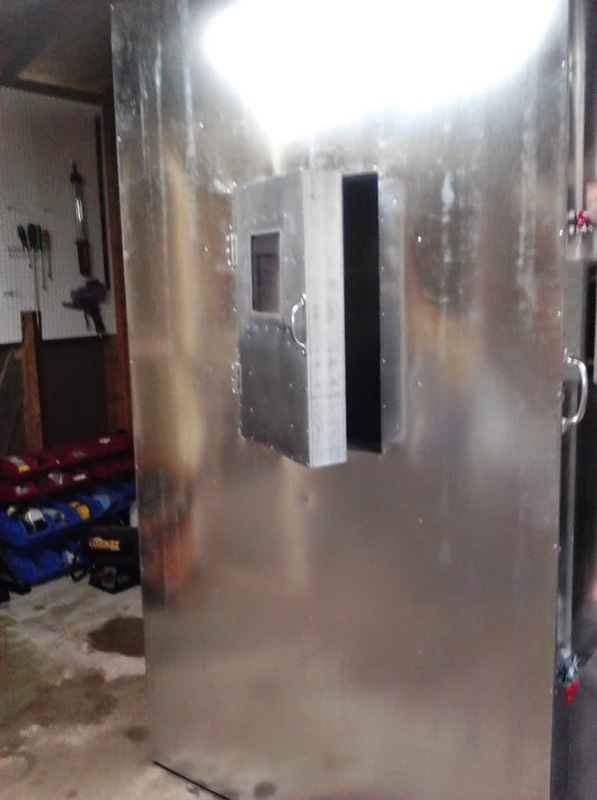 The link you posted for the tadpole seal is for a 12ft piece I built my oven to the size in the article and looks like you used one solid piece but its going to take a 20ft piece. Any ideas on where to get a longer piece? Is there no seal for the access door in side the main door? I am ordering the control panel kit (12,000 watts with light and fan) from auber itll be a week or so but if you guys like I can take some pictures of how the wiring works. Trying to get the rest of the money together for this build. I have the wiring diagram for the Auber system with the fan and light included. Thanks for taking the time to document this. I am wondering if you would have some ideas on a larger scale oven. Something big enough to fit say, a Dodge Ram in? 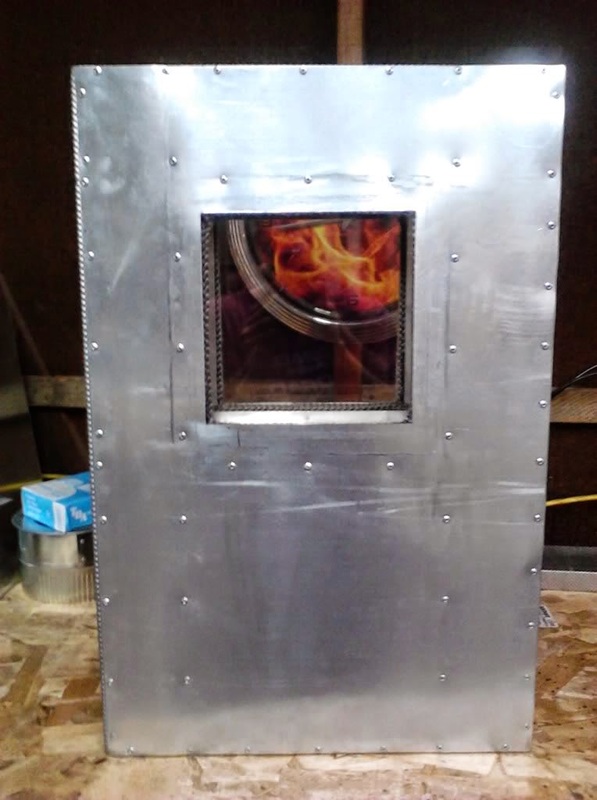 Would the heat source just be more elements or would you go for something like a gas or diesel fired burner similar to a spray booth? Did they send you a PDF with information an the instructions... because the kit that I bought has the fan and lights and it's the 12000 watt system instructions they sent me looked pretty plain and simple just a lot of tedious Little wires. I'm building one now... what is the size of the opening for the elements? What size in the element opening? The element openings are 16" x 16"
How are the elements wired ? seies circuit ?? That was my other question is it better to run the elements in series or parallel? The heating elements are wired in parallel. Can a booth like this be built to run on a 110V circuit? I don't have 220V in my garage but have been wanting to build an oven out there for a while. Mine probably won't be quite as big, but still want to be decent size. It is possible to build an oven with 120V heating elements. They are more expensive than 220V elements because they aren't used as commonly. I cannot give you specifics on how to build it without doing more research but it is possible. An alternative though would be modifying an electric smoker. They give you some decent dimensions but still smaller than a household oven. They will reach 400 degrees F with some extra insulation and shielding on the bottom. Would it be beneficial the stager the four heating elements up the back wall for even distributing of heat ? 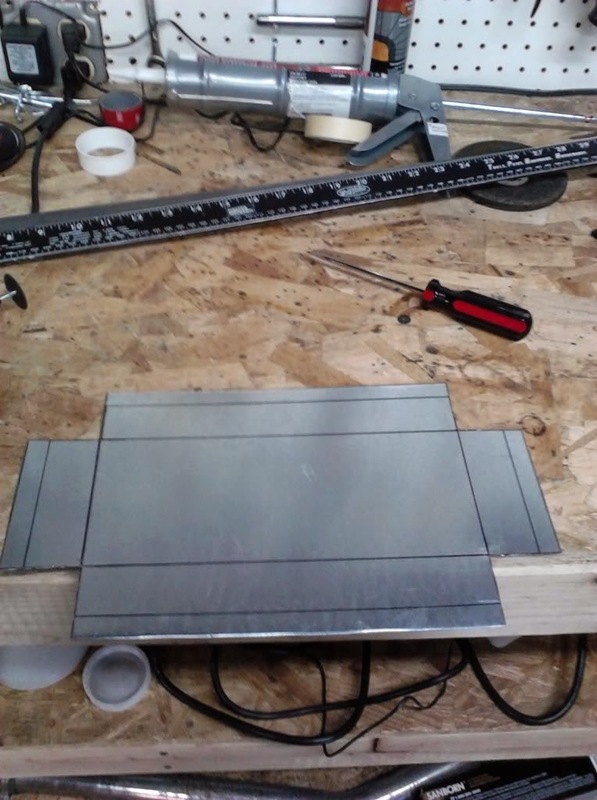 The article doesnt say wether or not any extra support was added to the oven to hang the door.This is something to consider.Im just getting started on my oven build and will be adding the extra support,just gotta figure out a good way to go about it. Maybe even weld the hinges to the oven? Its helped me out tremendously and im sure its jelped many otbers as well. Yes, this oven build did not have any extra support for the door, but it is a good idea to prevent the door from sagging. I have seen steel angle used on the hinge area with the hinges riveted to the studs from top to bottom and then the hinges are bolted through both the stud and angle iron. The rule of thumb is 100 to 150 watts of heating element per cubic foot of oven. An oven that is 6'x3'x20' is 360 cubic feet and therefore would need at least 36,000 watts worth of heating elements. That would be 18 2000 watt heating elements. That many heating elements would require 150 amps of power. So it is technically possible but you may be better off with alternative forms of heating such as a gas-fired oven. 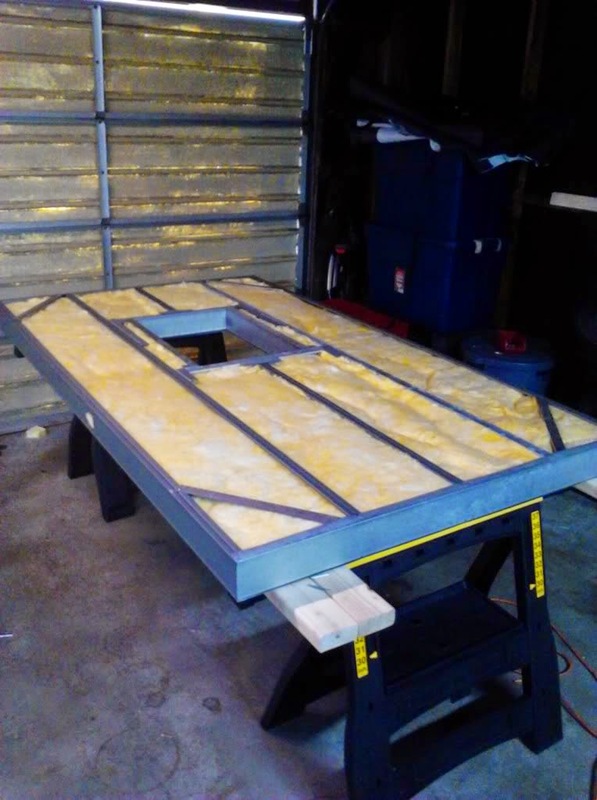 Fore more advice on building an oven that large, I would suggest you head over to the Caswell Plating Oven Building forums and start a thread there. Good luck on your build. Heating elements are placed on the bottom of the oven because "heat rises". When the heating element is just turned on, the heated air around the heating elements becomes less dense than the colder air in the upper part of the oven. Because the air is less dense, it will rise and be replaced with the denser colder air. This cycle continues until all the air in the oven is eventually at the same temperature. This is called a natural convection current and if you look at most ovens, the heating element is generally on the bottom for this reason. To speed this process up and ensure an even temperature distribution throughout the oven, this oven was also built with a blower motor that forces the air to circulate. I have a question on the access door. i did not see from the build any kind of insulation or strips around the access door to keep it air tight, did i miss a step? 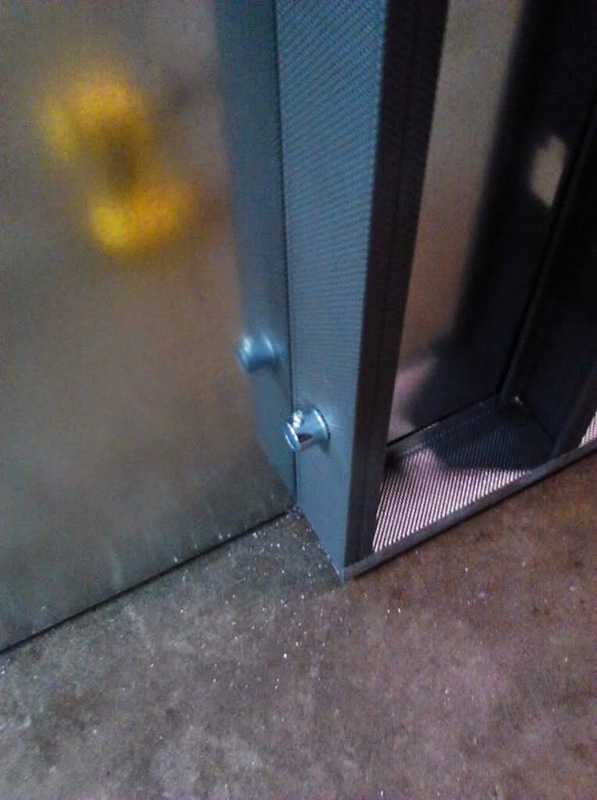 Hey Sean, how did you seal around the access door to prevent leakage? I can use your heating element like you? great article. I'm in the process of building one like the one you built. If I use the Auber 120000 panel does it include everything as well as a instructions on how to wire everything? It includes instructions and all components for inside the box. However, you will need to crimp your own wires. However, you will need to buy the external wiring separately such as the wiring that goes from the box to the heating elements, fans, and lights. 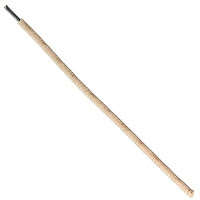 You will need high-temp wire for any wiring that is ran inside the oven walls. I can't tell from any of your pictures but where is the thermocoupler opening in relation to the forced air holes? 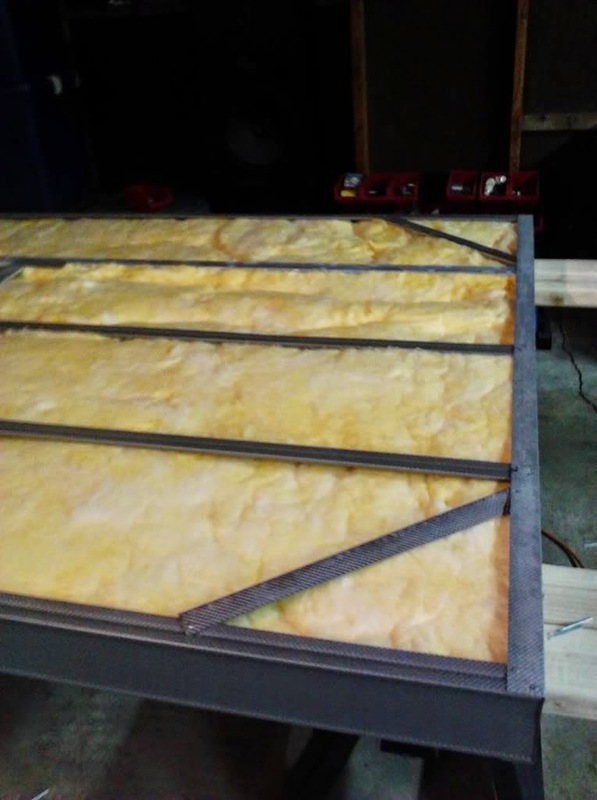 If you scroll up to this page where it says "Here you can see the layout of the 4 recessed heating elements along with the insulated panels mounted behind them. ", there is a picture below that sentence that shows the location of both. There holes are hard to see but they are located near the bottom of the oven on the right oven wall next to the heating element cutout. If you open the picture and zoom into it, you can see them faintly. The thermocouple housing is about 2 ft up from that location. There is a mounting plate at the base of the heating element. Three rivets were used on each heating element to secure the plate through the sheet metal and stud. Thanks, for this amazing wright up, I will be using in in my upcoming oven build for sure. This was an Excellent detailed, written and visually displayed build. Thank you for your time and knowledge. I plan on building your exact oven and hopefully I plan to expand the size of my next one in the near future. You certainly are a patient guy as you politely keep answering multiple questions that were already addressed in your presentation. Again thank you very much! Best oven build I've seen so far. I am designing an oven for carbon fiber post cure..very similar to a powder coat oven. I may use it to dabble with some small powder coat parts as well. As it will mainly be for curing tubes, the dimensions are 2 feet deep by 2 feet high by 6 feet wide. A chest oven, if you will, that will have a hinged top. I am limited to 120v, 20 amp service, so I have chosen to go with a convenient albeit expensive finned ceramic strip heater around 2000 watts. This puts me under my 20 amp limit, however at under 100 amps per cf of oven, I am concerned I won't be able to reach my 350F goal. 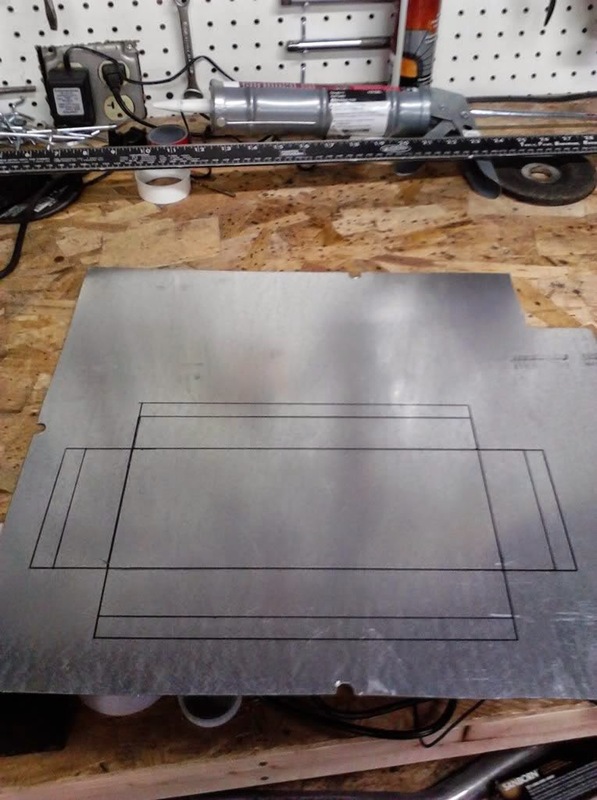 Considering that this is a chest design and only 2 feet high with a 30 inch long heating element, and I am going to 350F and not 400F, what do you think? 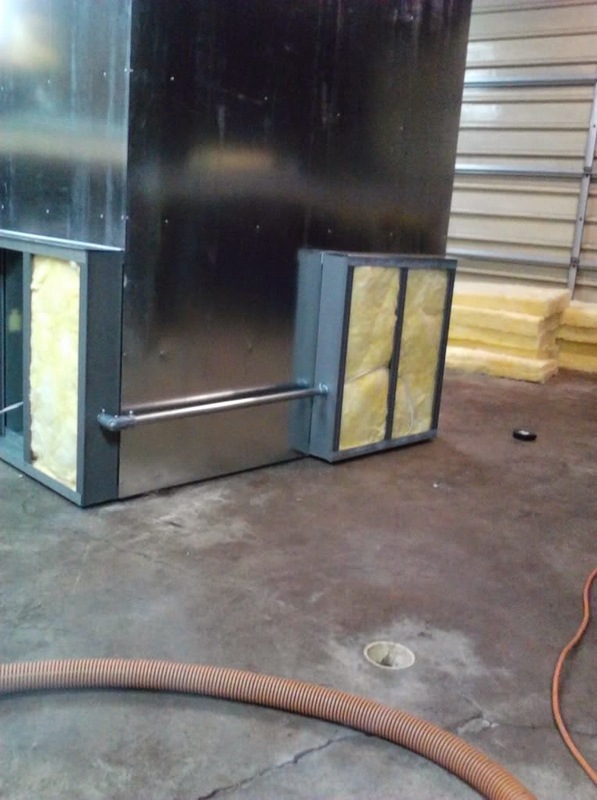 Also, I am installing a single small blower (the small Dayton high temp at 79 cfs), at the center top of the front face (opposite the hinges) with internal ducting that will reach back down and expand and widen to blow over the entire 30 inches of heater. The duct could entirely cover the heater at the bottom of the oven, blowing the air over the fins in true forced air fashion, or stop short allowing the air to exit the duct and circulate more naturally. What do you think? As an alternative, I could get another twin blower and space them on opposite ends of the oven and connect the ducts at the bottom before they expel to the heater. At this point I would rather not incur the cost though. As I understand things, it is better to pull from the center than the ends or corners?... About the fan in the build shown here. I read the entire article, but seemed to miss somewhere as to how the fan is attached to the roof. I see no rivets or bolts through the ceiling. What is the fan bolted to? Did the builder use high temp rtv to seal the intake? Too difficult to tell from the pics. One last thing. I bought an Omega PID before I found this article. I hope it is good enough quality. I saw some bad reviews. Anyway, on this build I see there is a timer installed. Isn't that the job of the PID or am I missing something? Thanks.